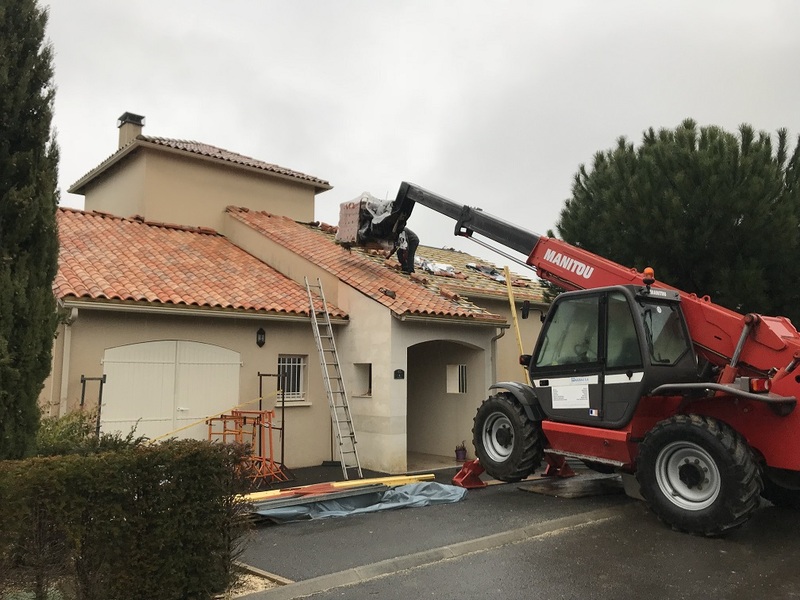 Les photos ne faire défiler automatiquement, mais vous pouvez également cliquer sur les flèches pour montrer l'image suivante. 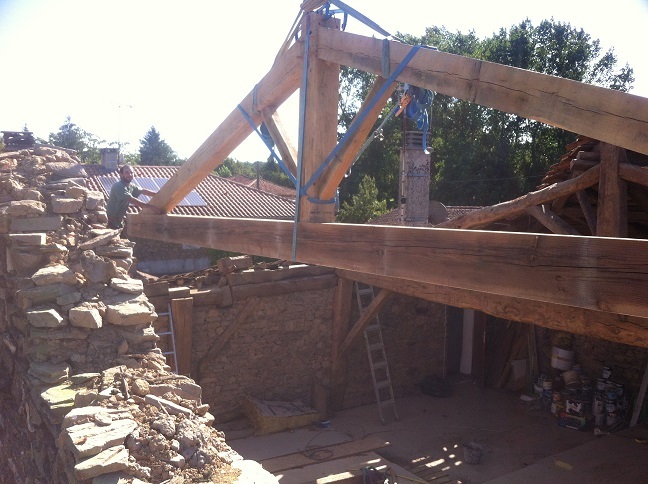 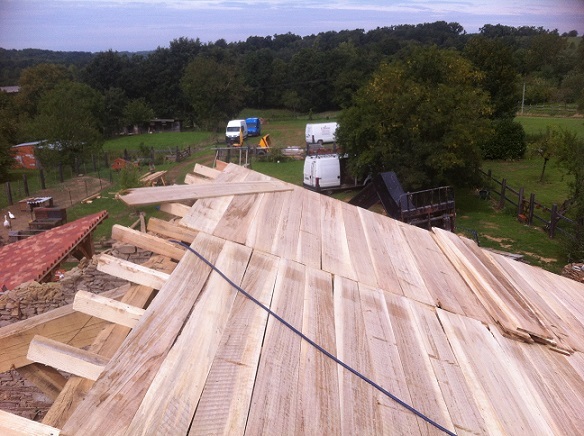 ...Then put into place like a giant jigsaw puzel. 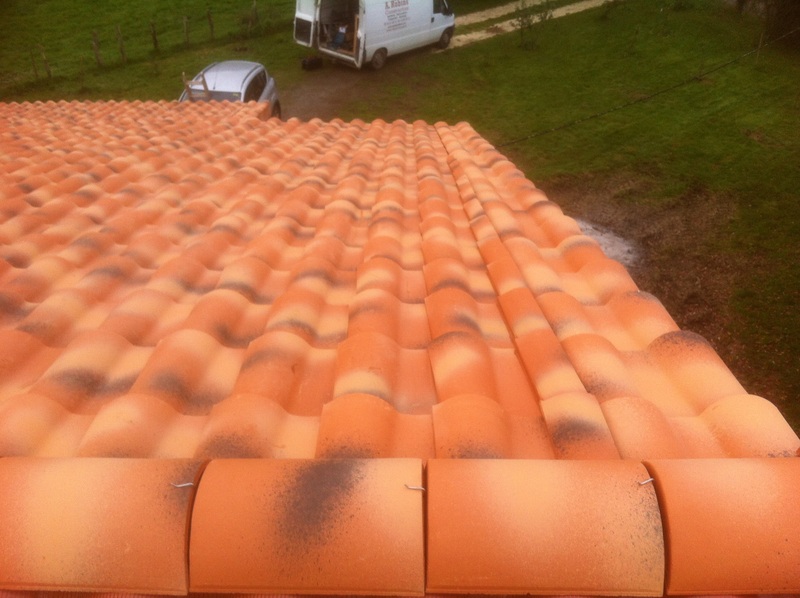 This house is only a few years old but Adrian has had to re cover it using new interlocking Latitude 12 tiles, new volige, insulation & membrane as it was not done correctly and leaking in several places. 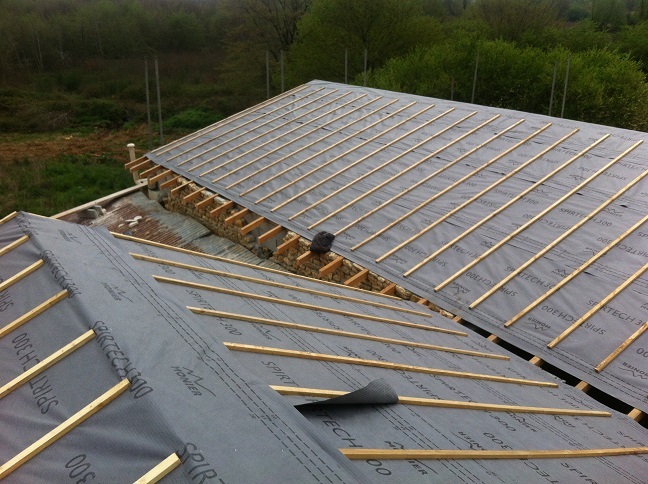 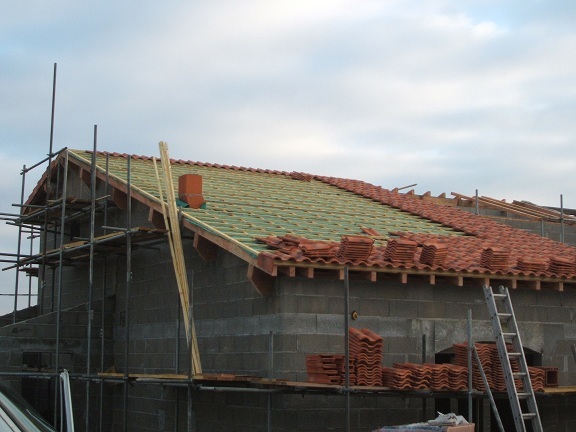 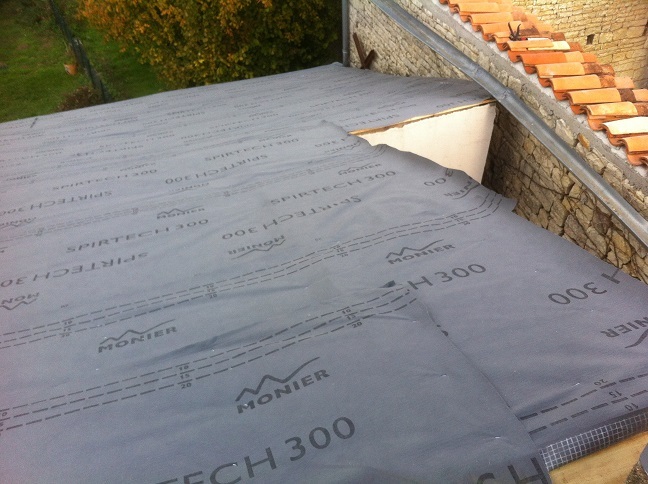 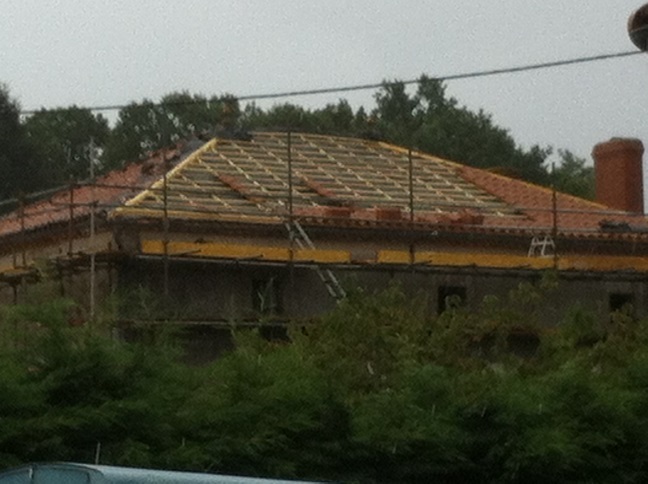 More roof's like this to follow. 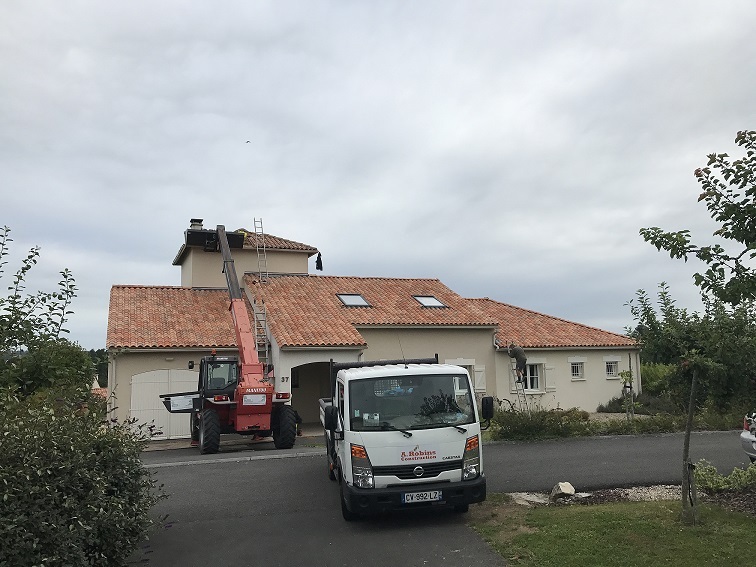 For this project the roof has been replaced, septic tank installed plus more still to come of which you will find on the renovation page. 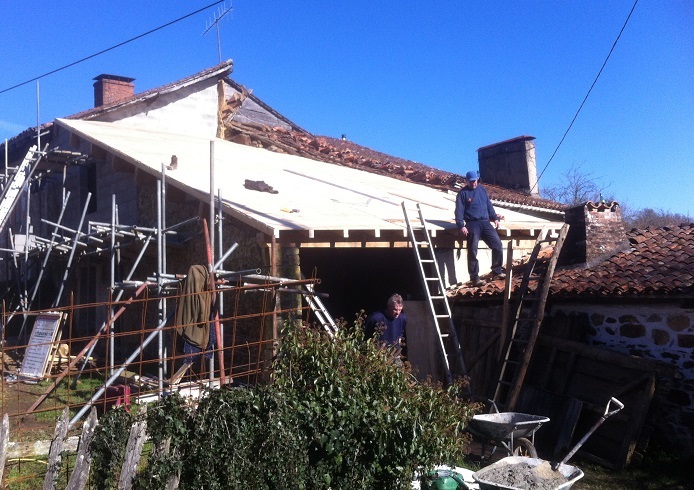 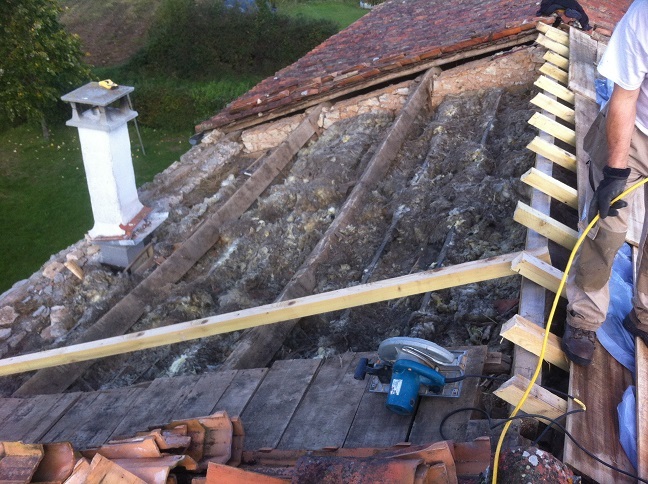 On this property the whole roof needed to be removed along with most of the front wall. 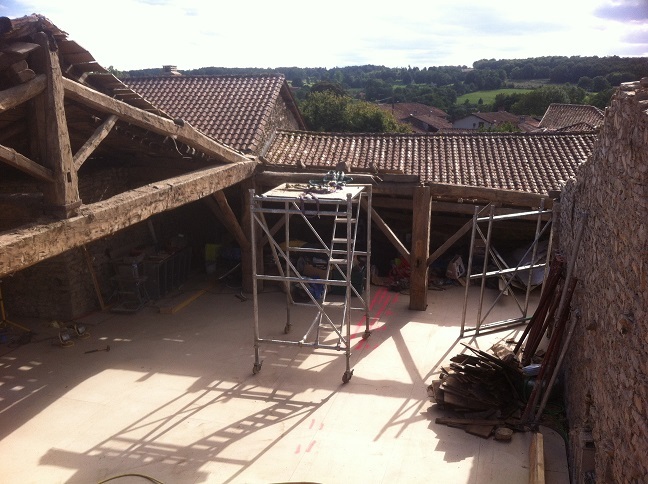 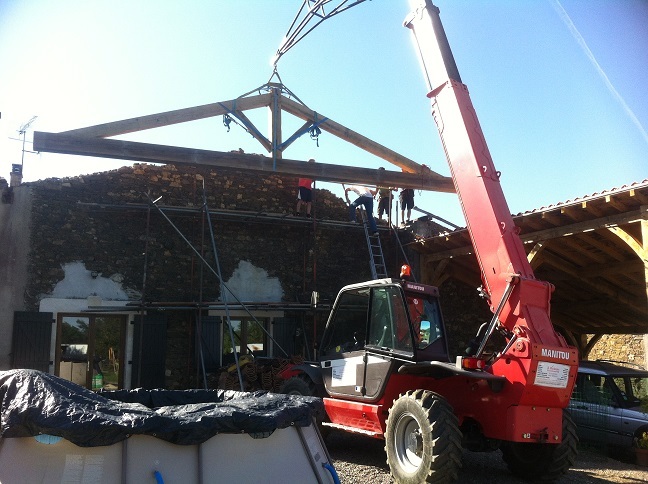 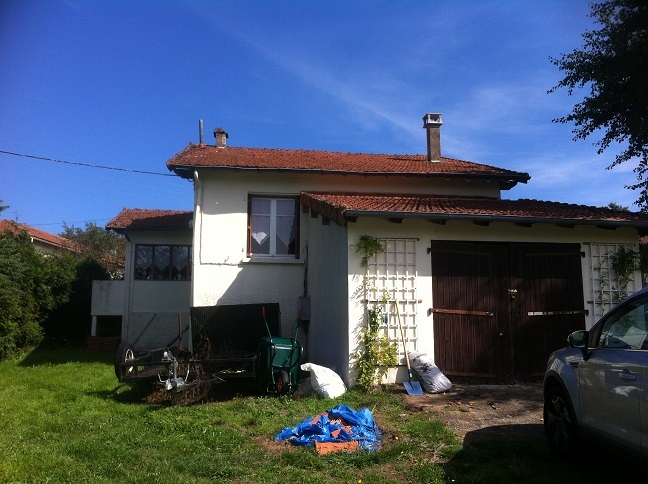 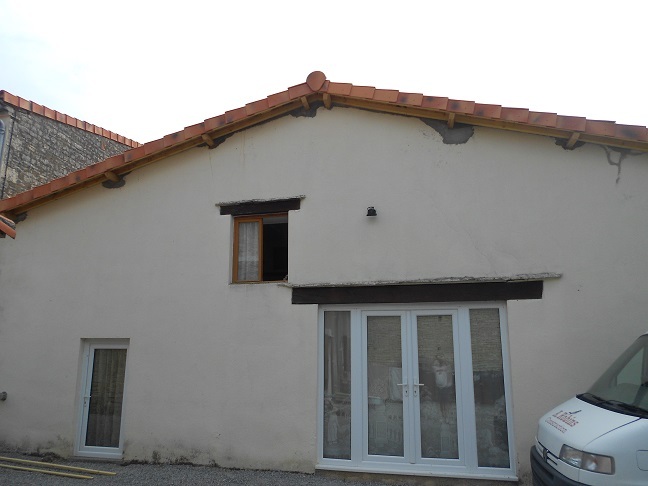 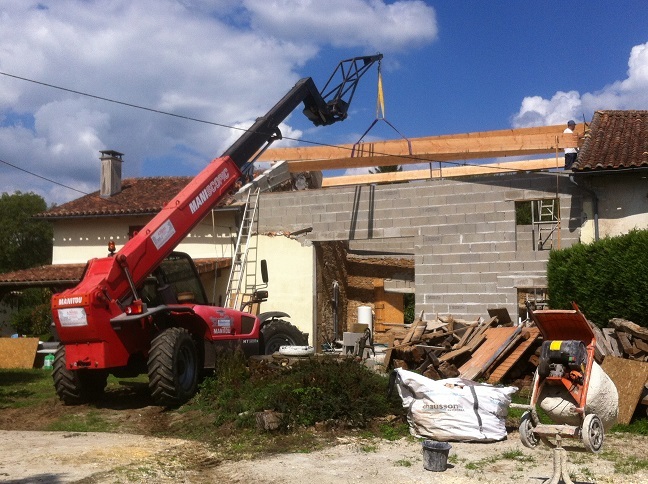 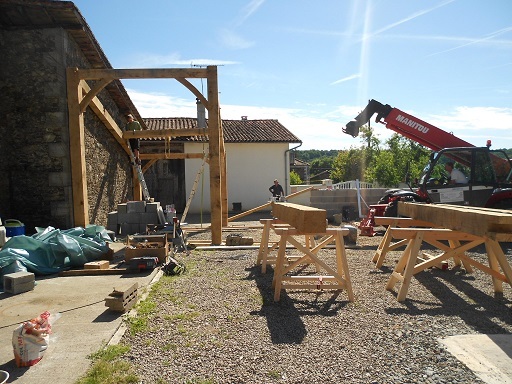 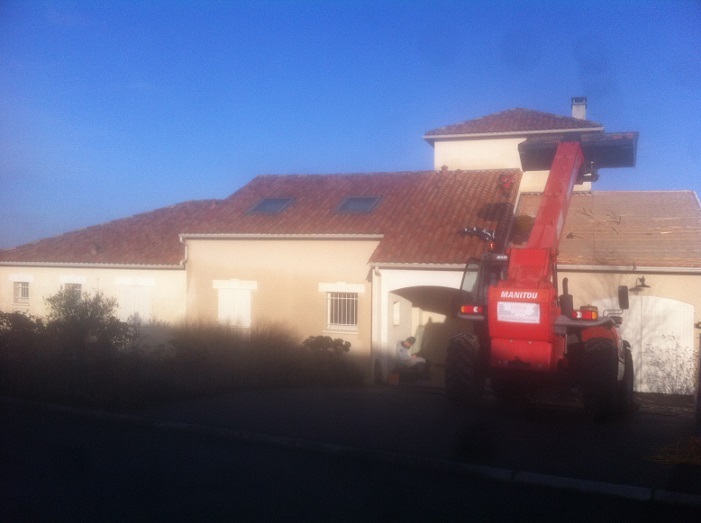 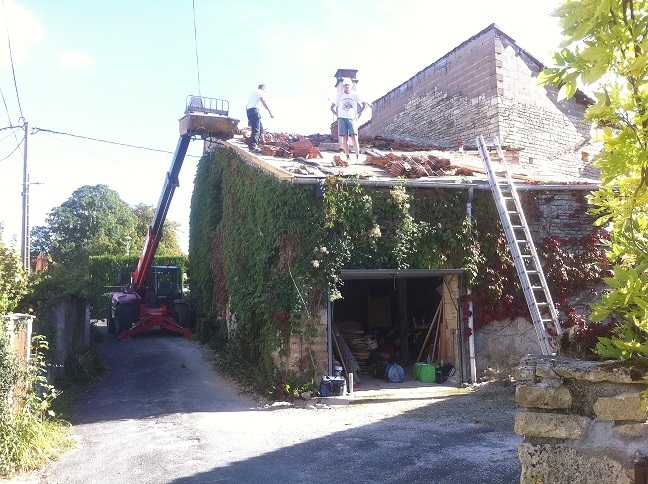 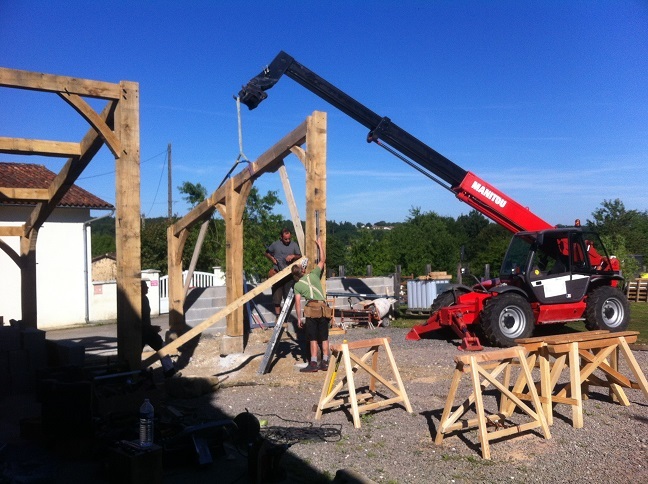 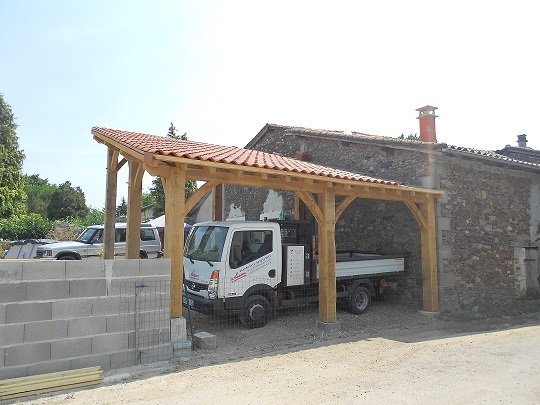 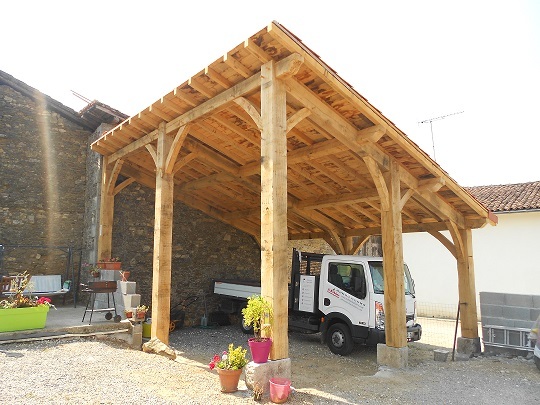 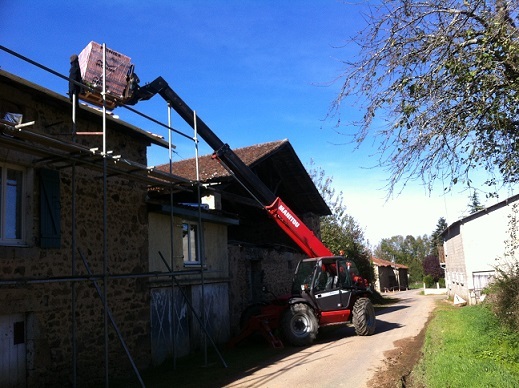 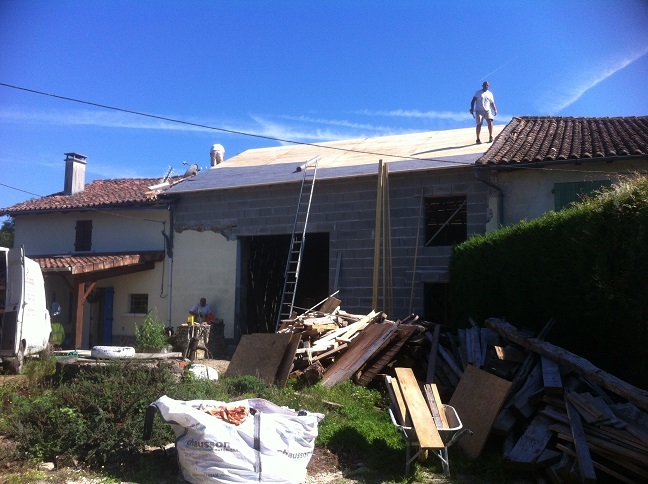 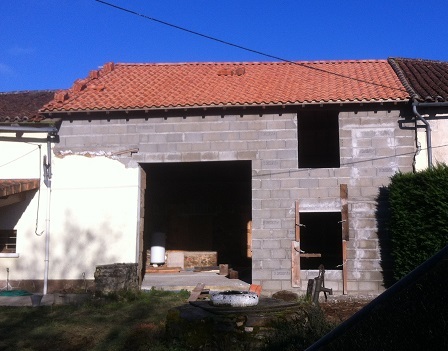 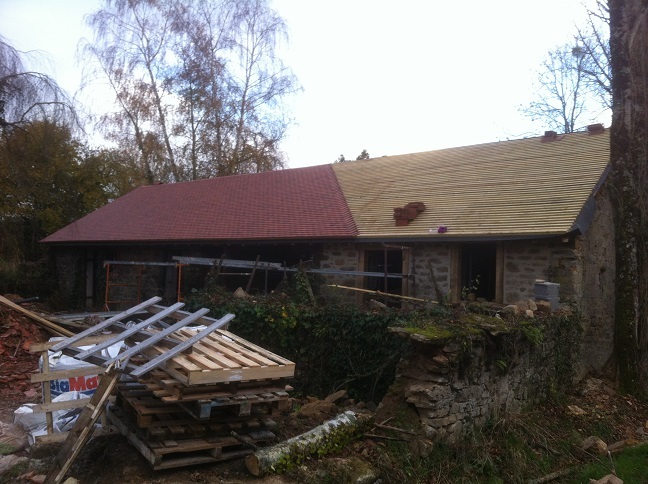 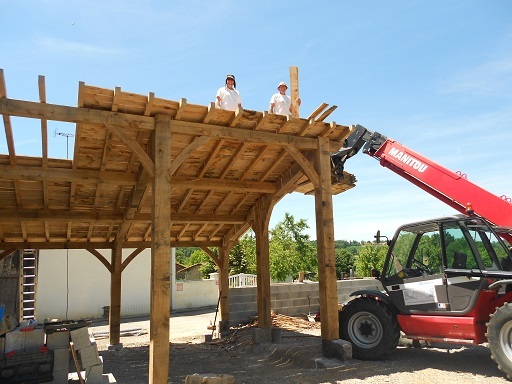 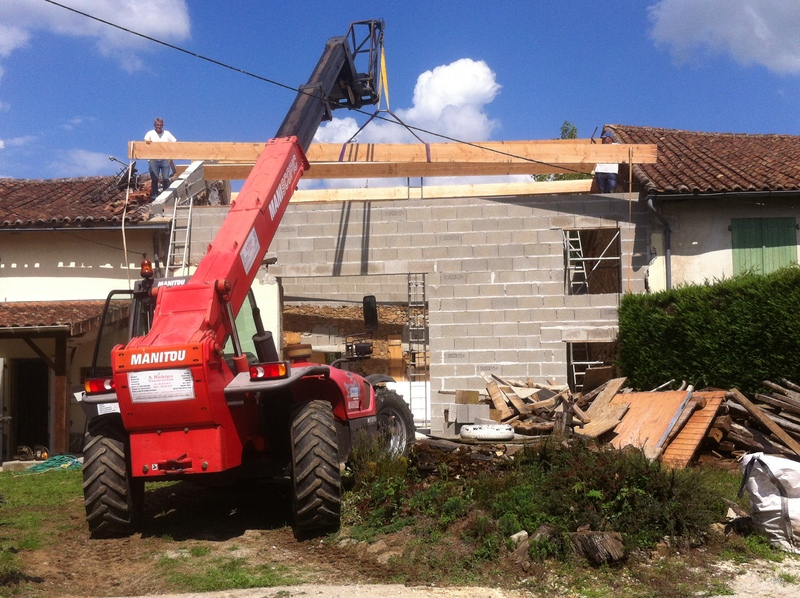 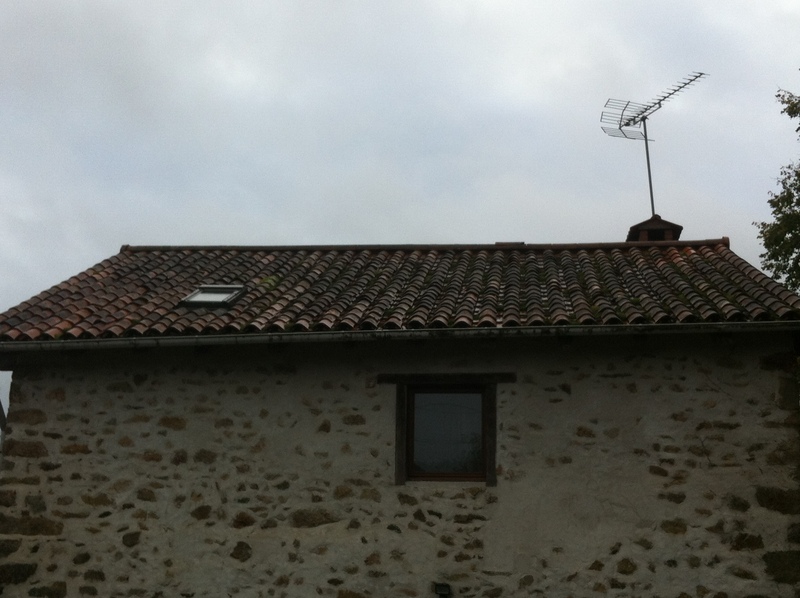 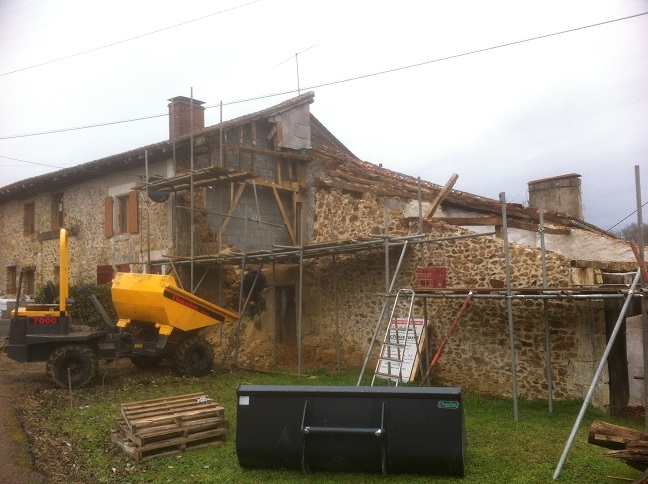 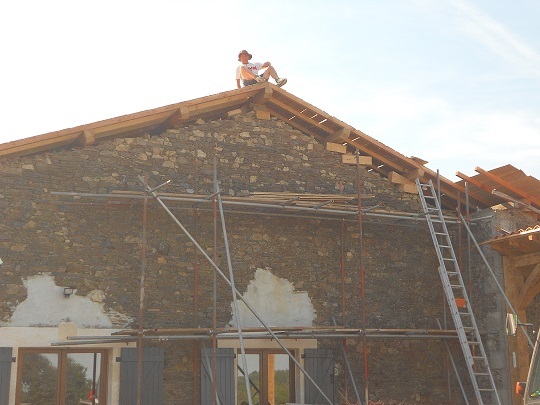 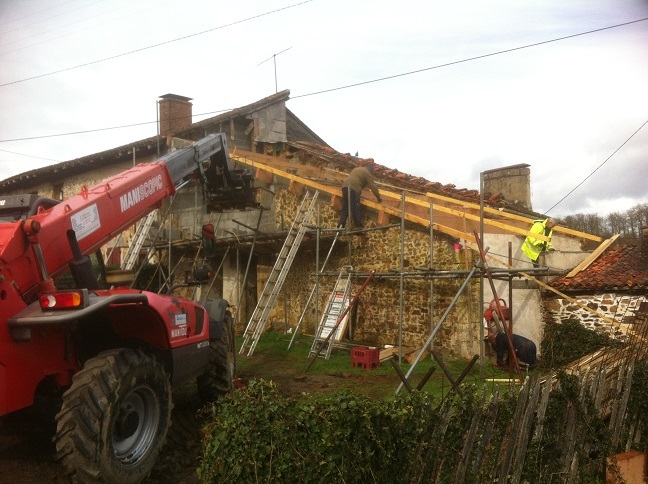 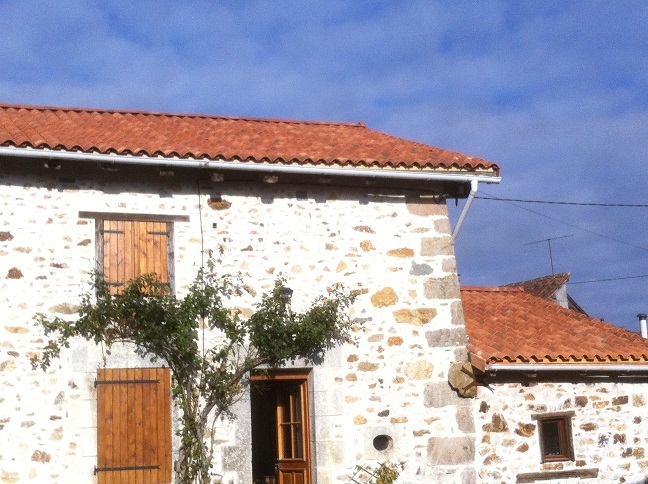 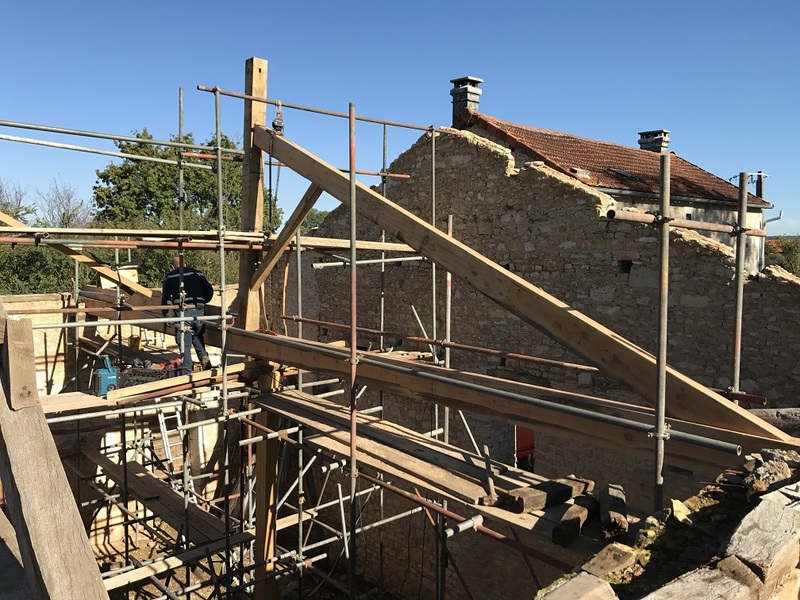 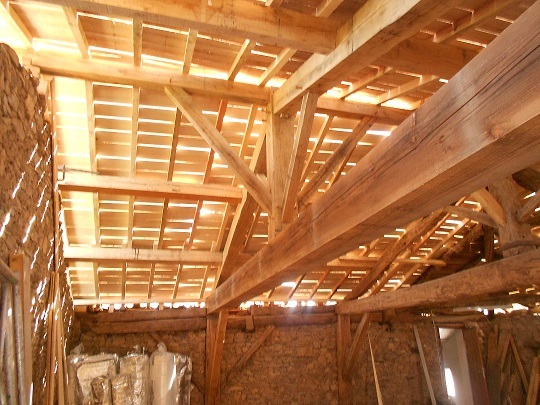 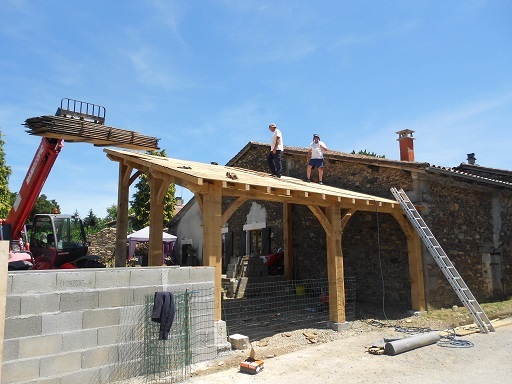 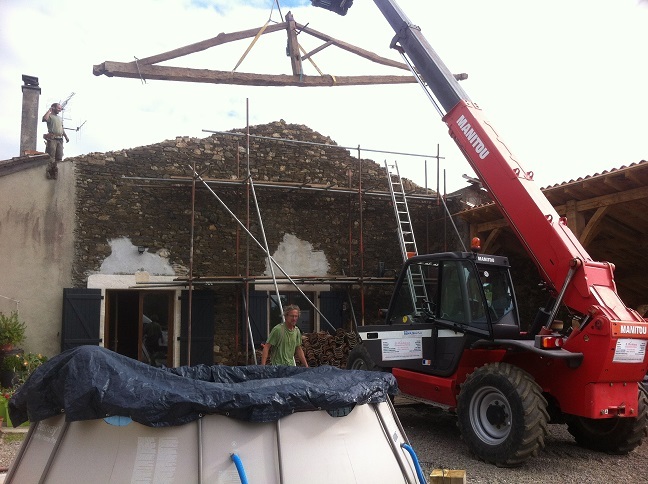 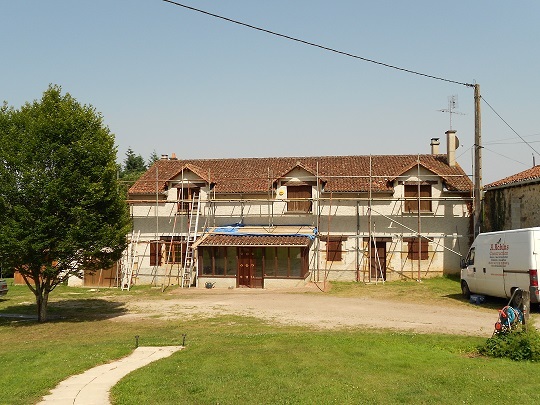 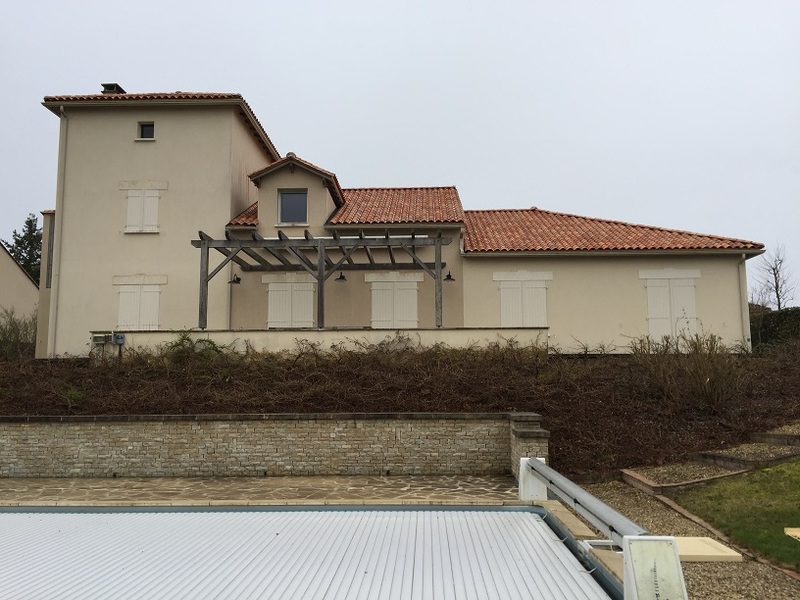 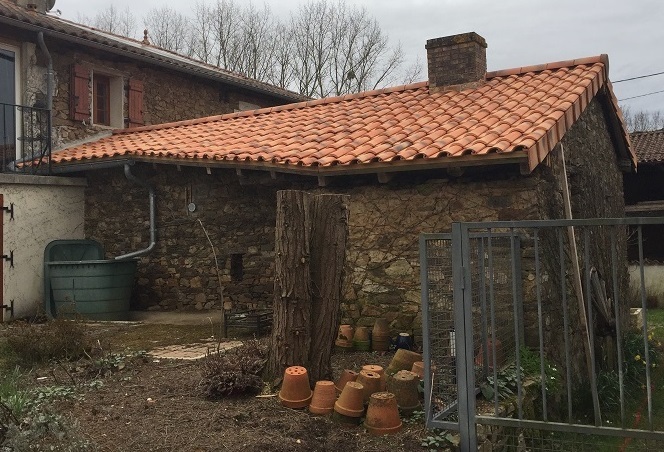 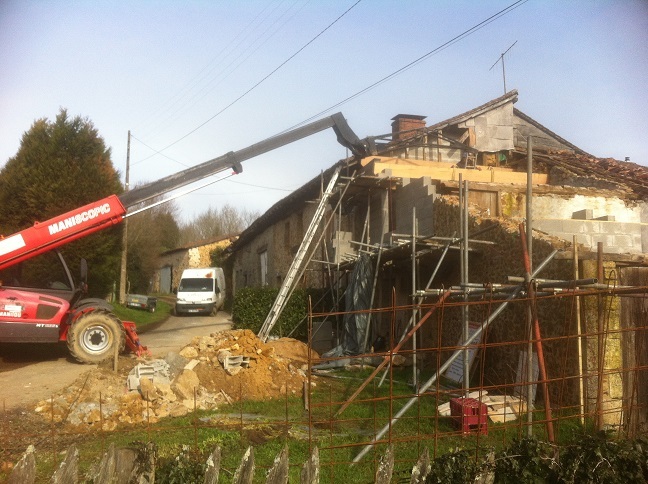 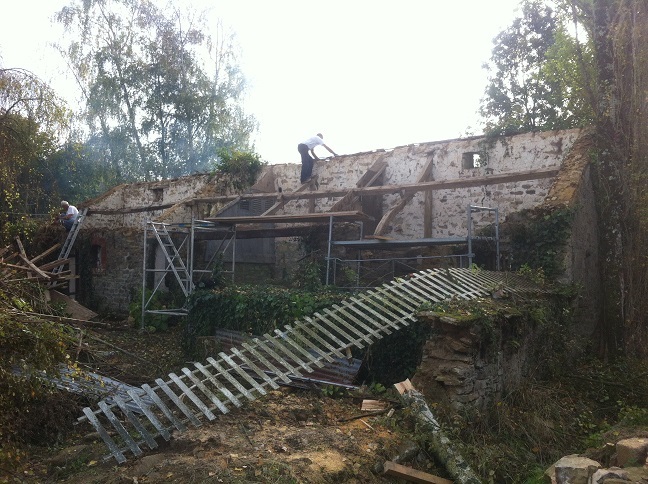 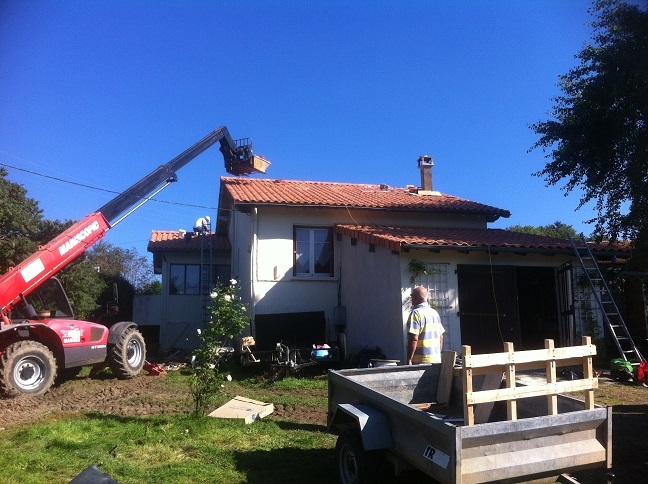 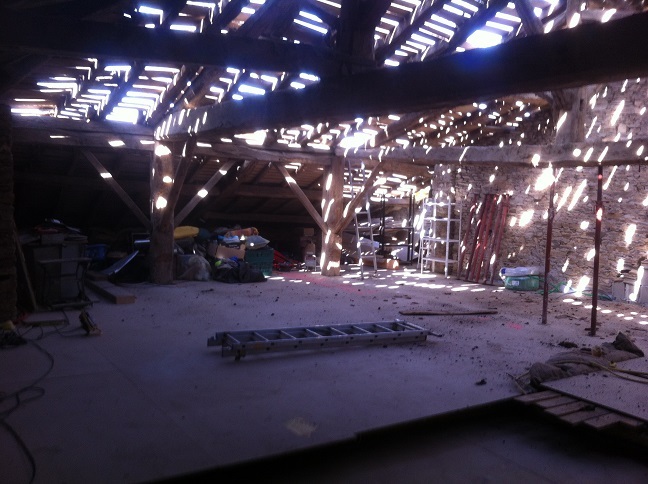 Once Adrian & his team have worked their magic this will be a small gite & barn. 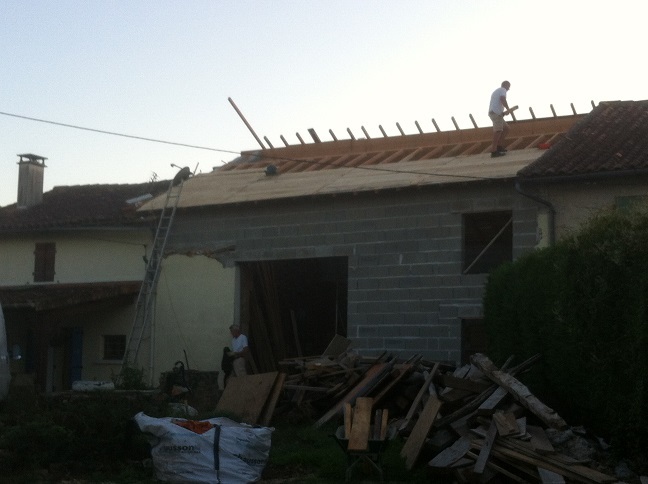 See renovation page for more photos of progress. 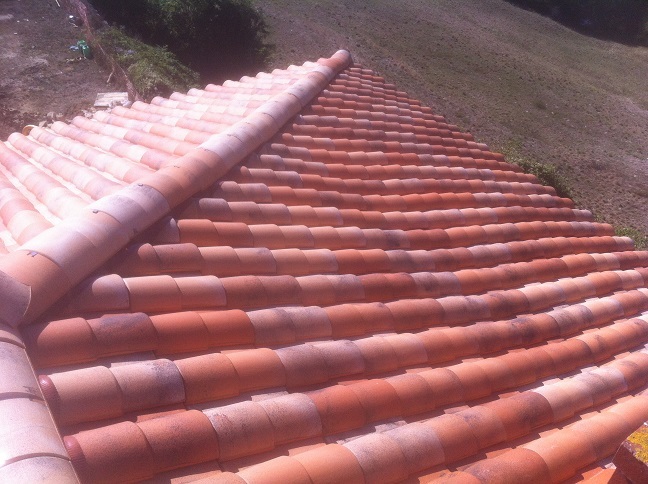 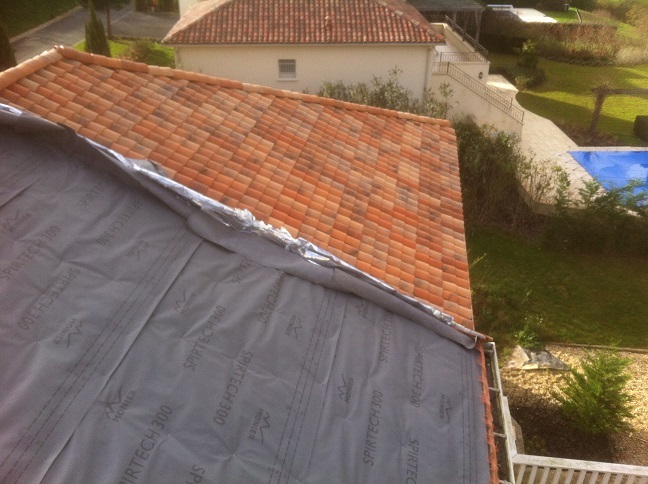 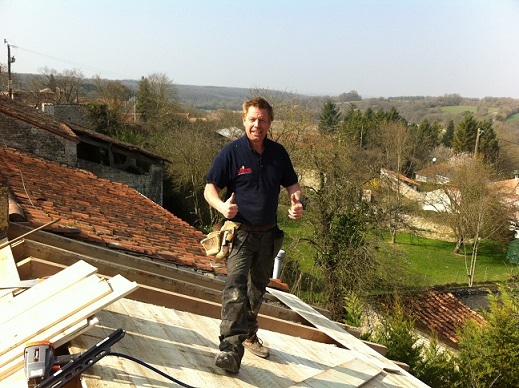 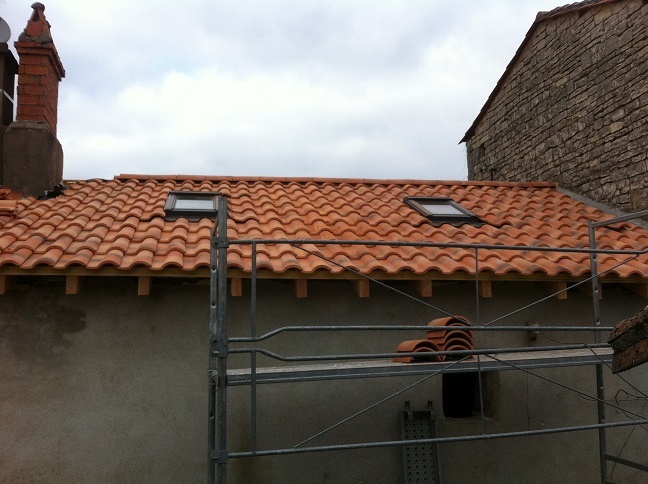 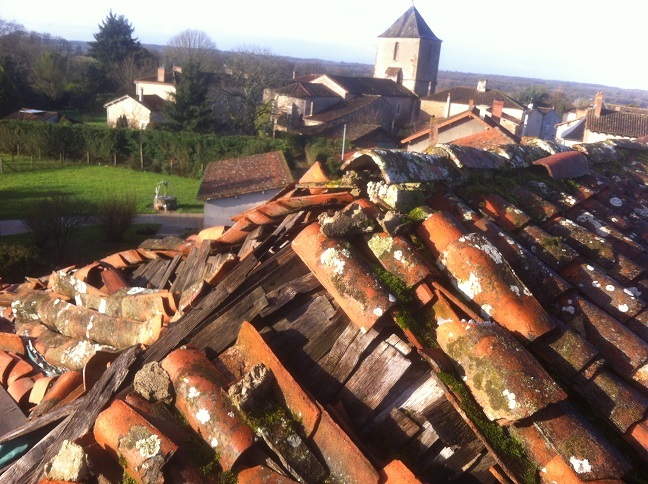 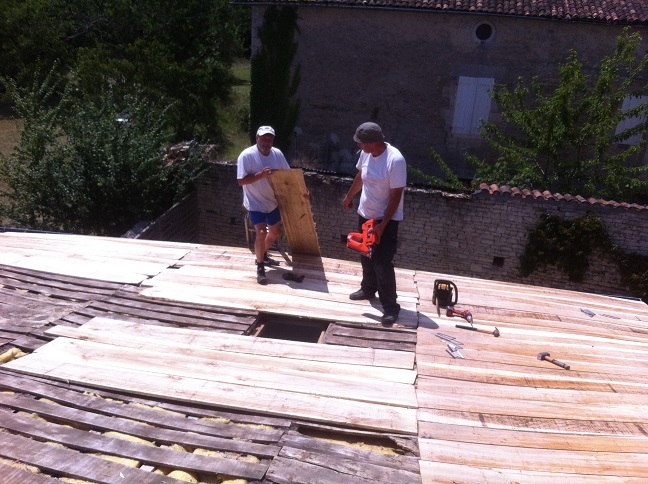 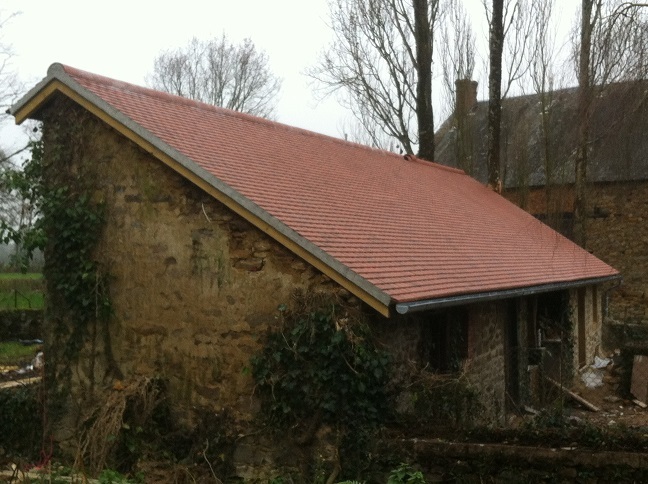 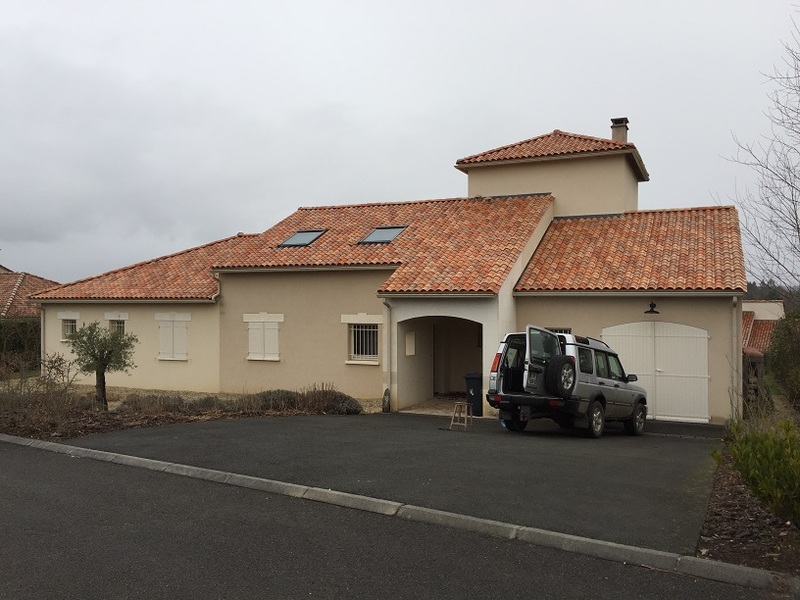 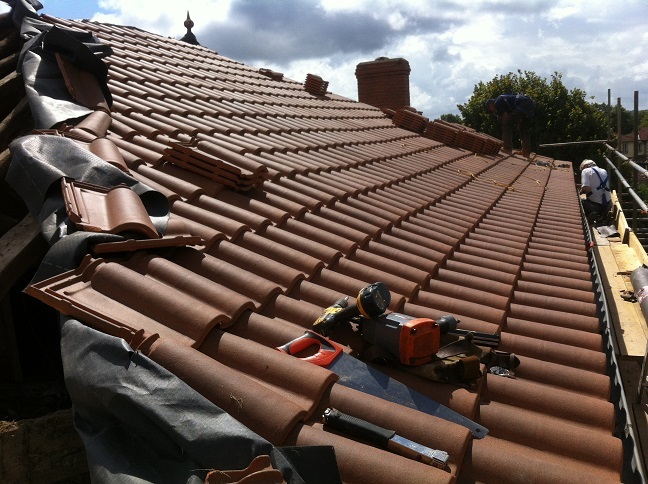 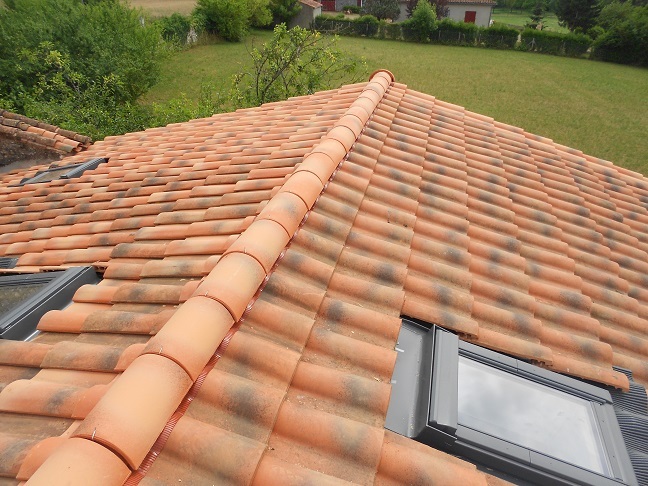 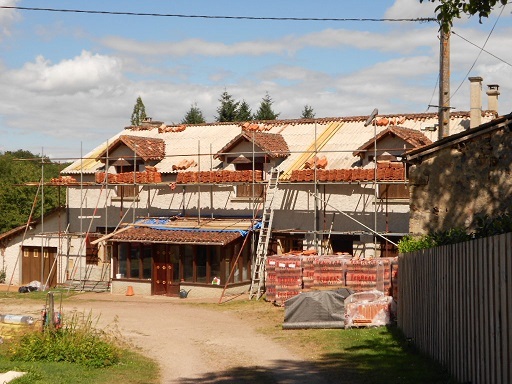 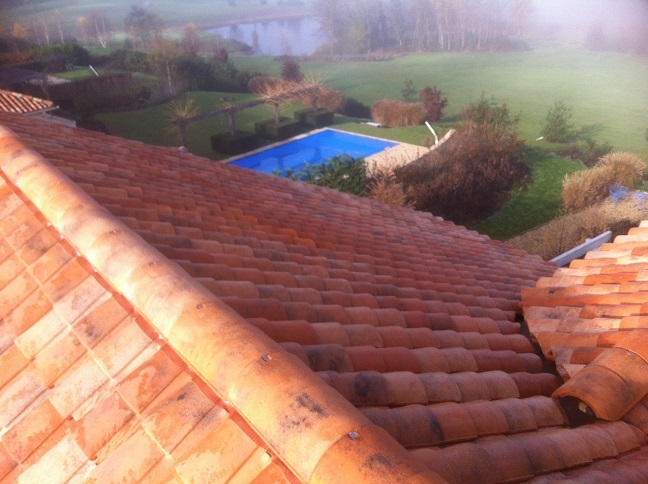 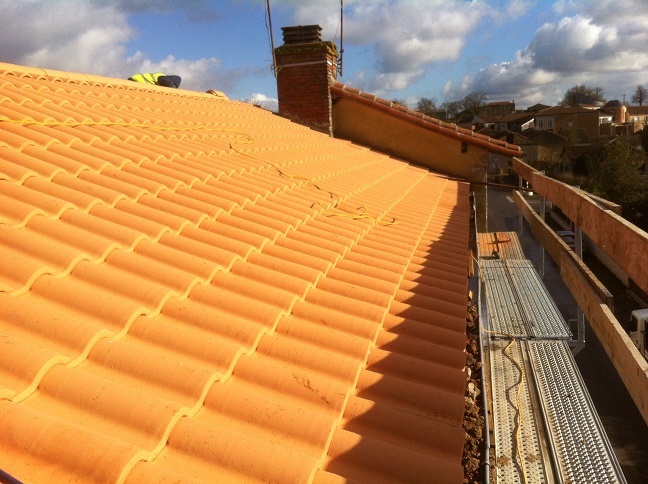 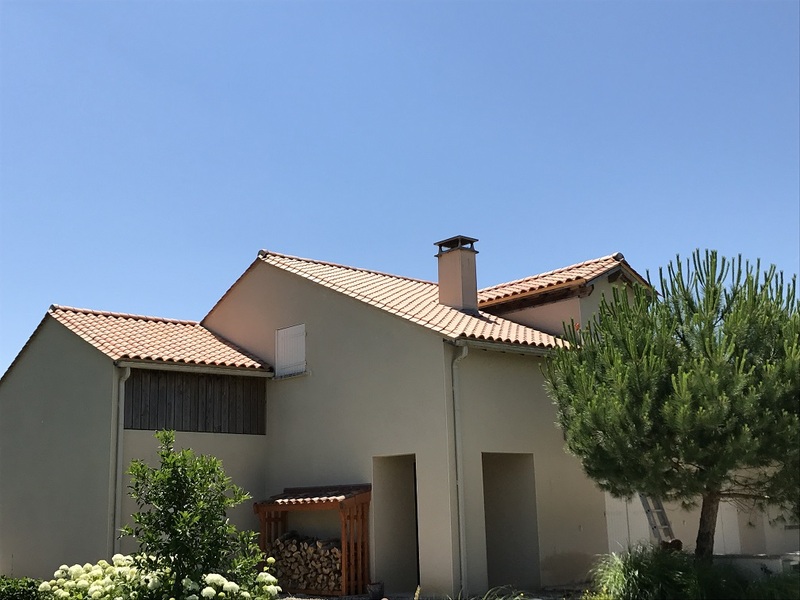 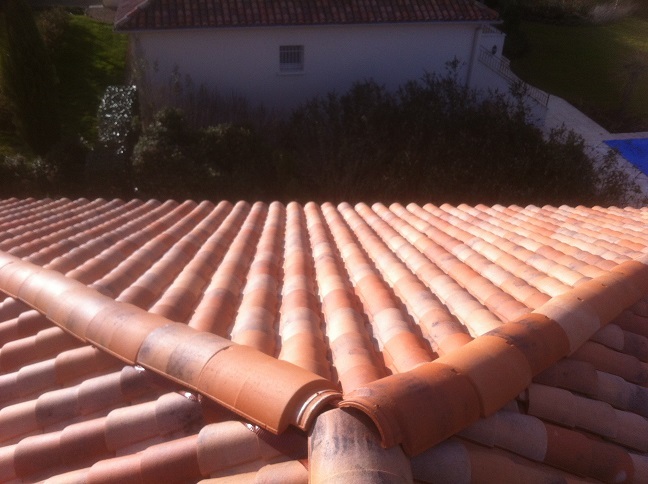 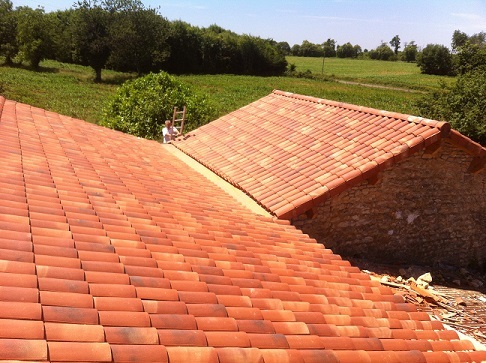 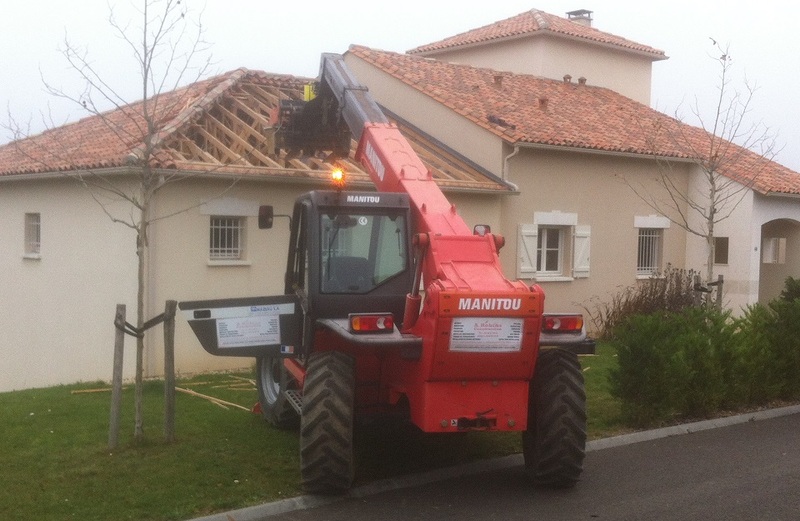 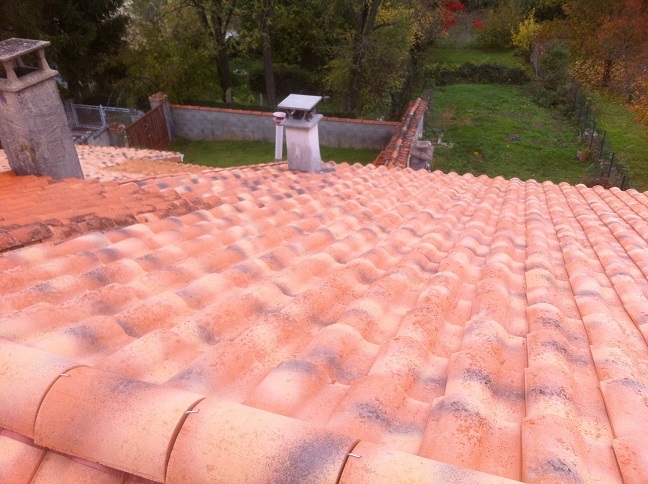 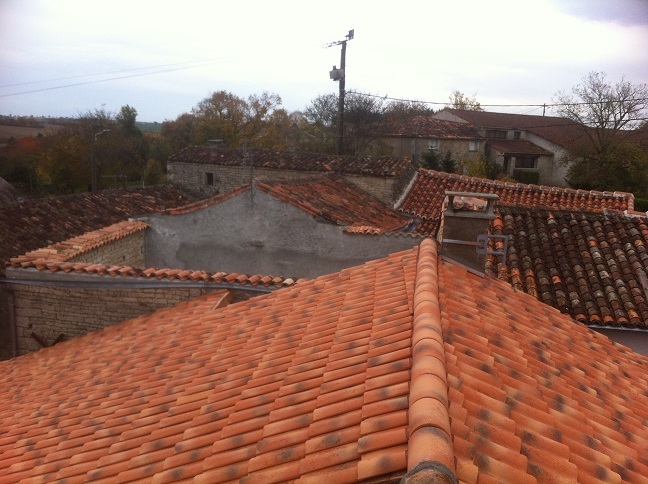 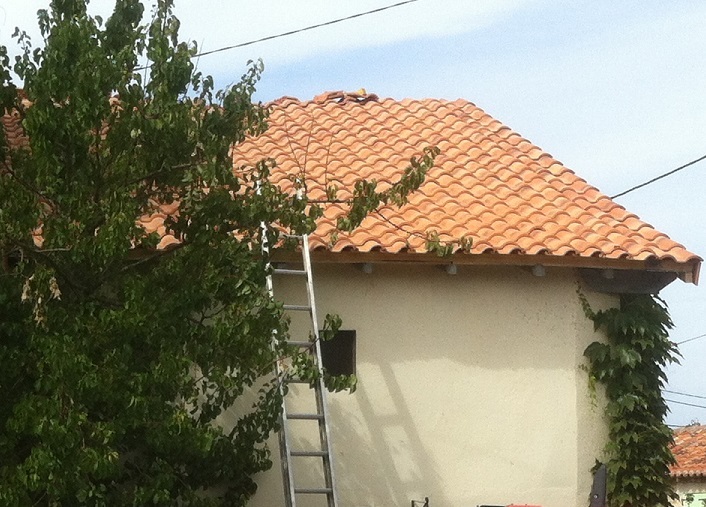 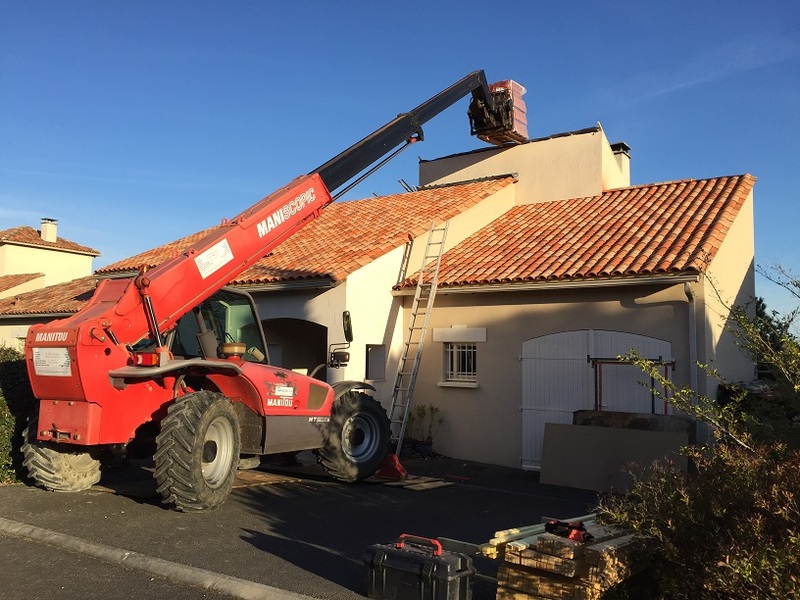 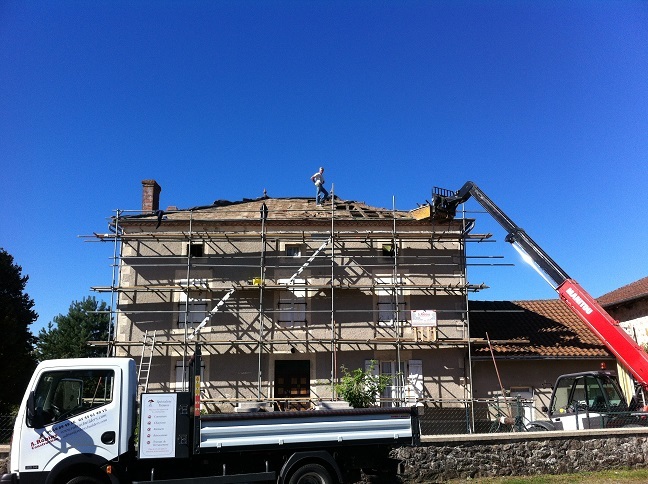 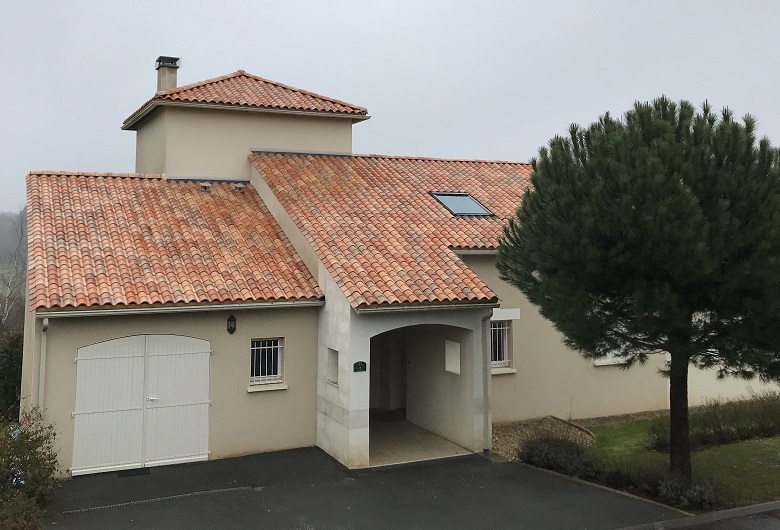 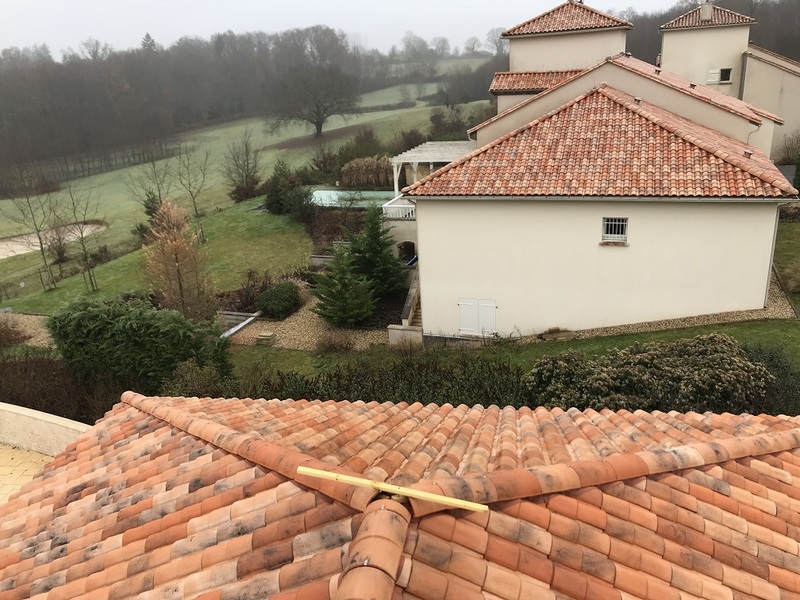 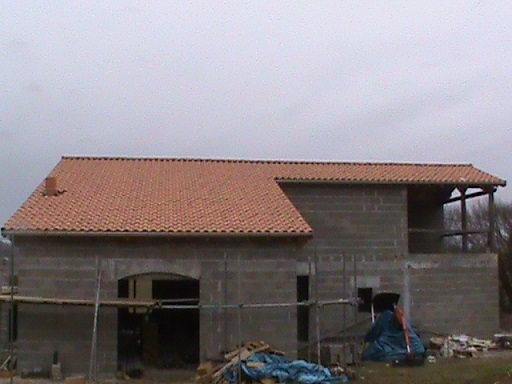 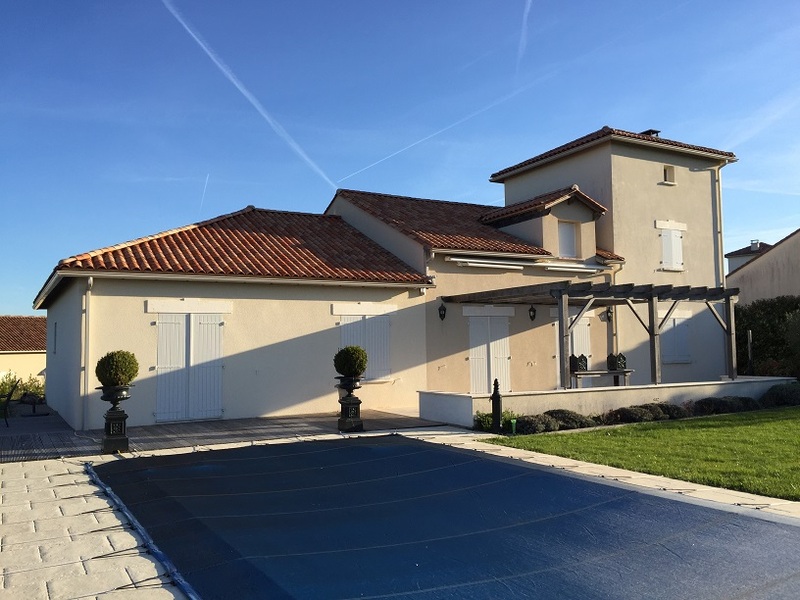 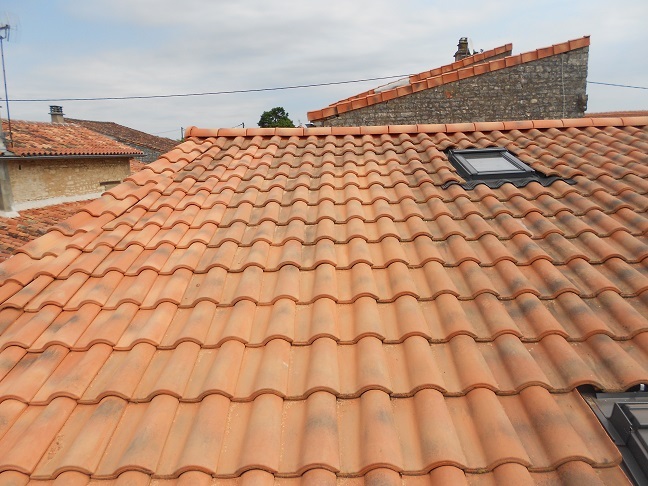 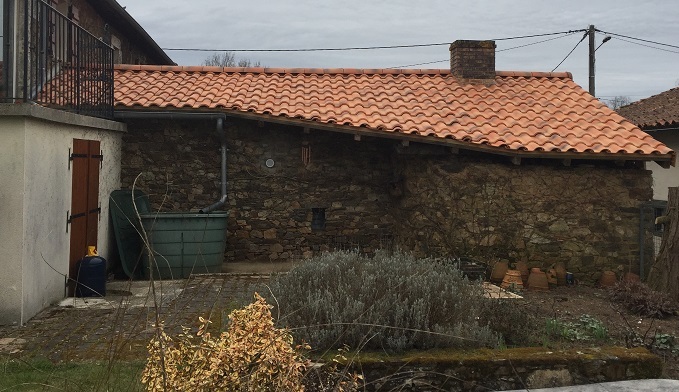 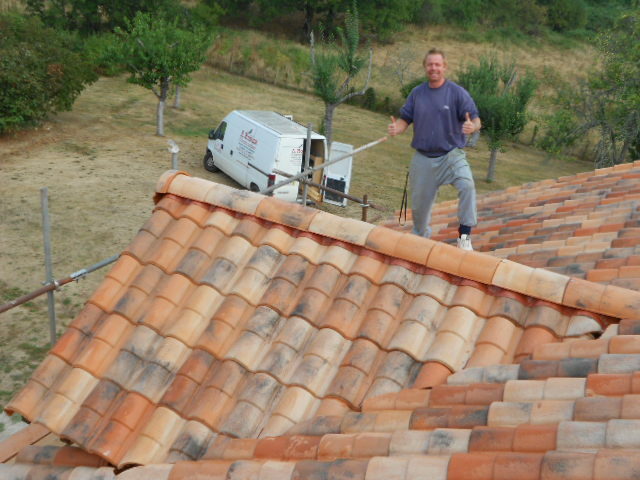 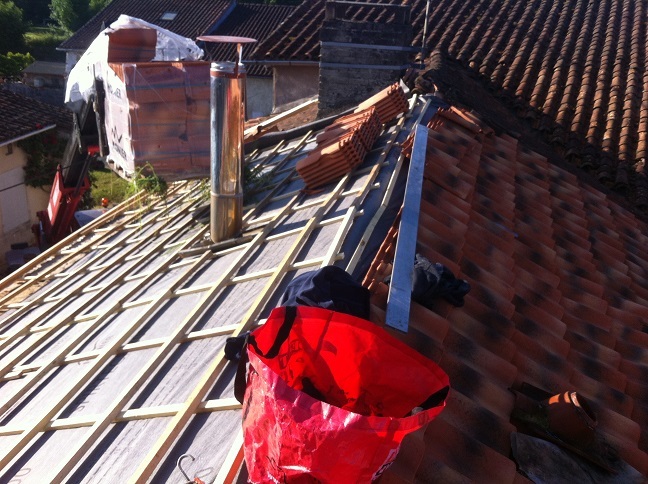 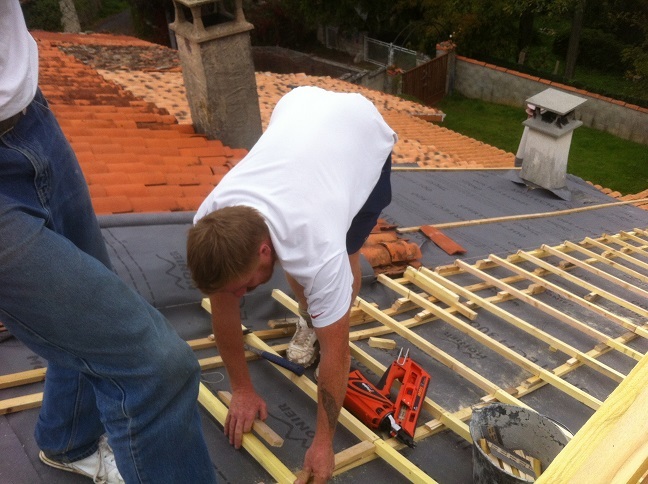 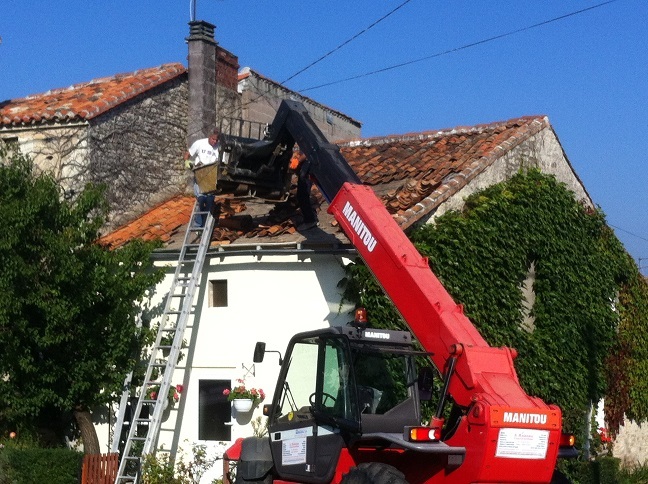 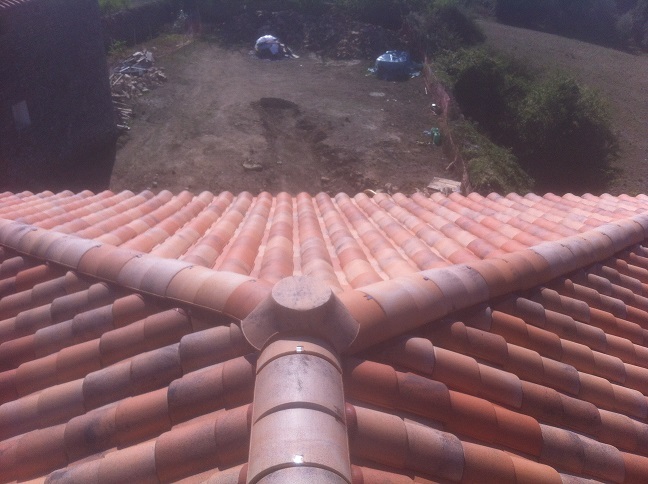 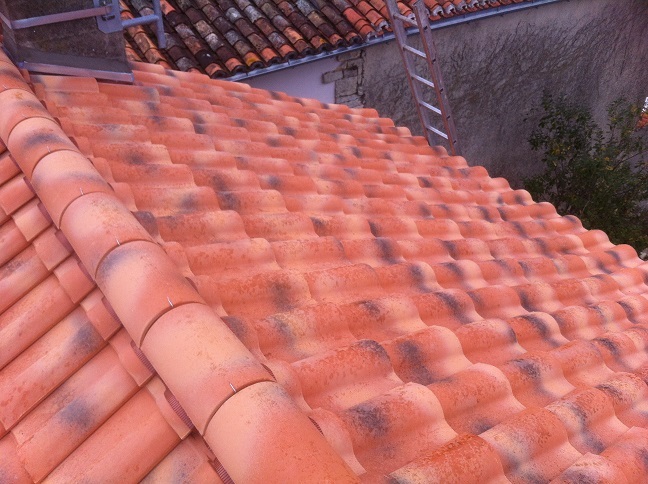 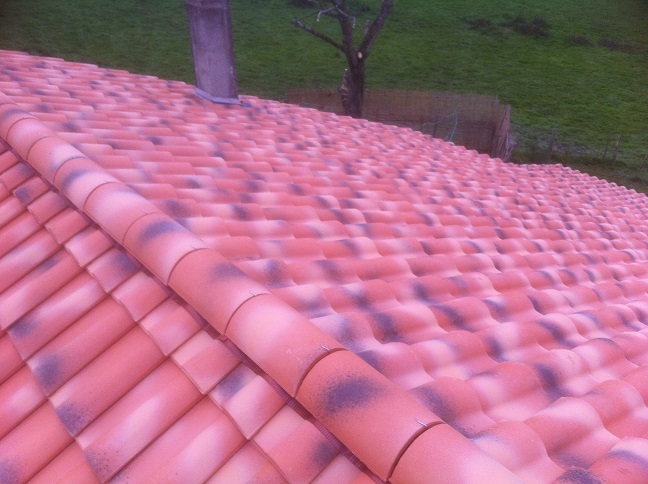 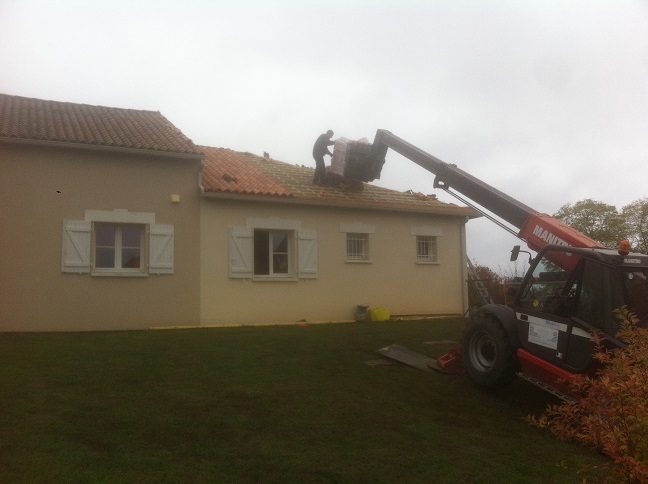 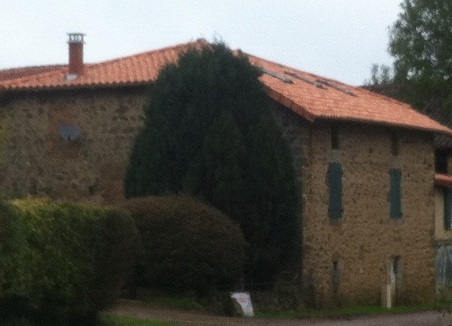 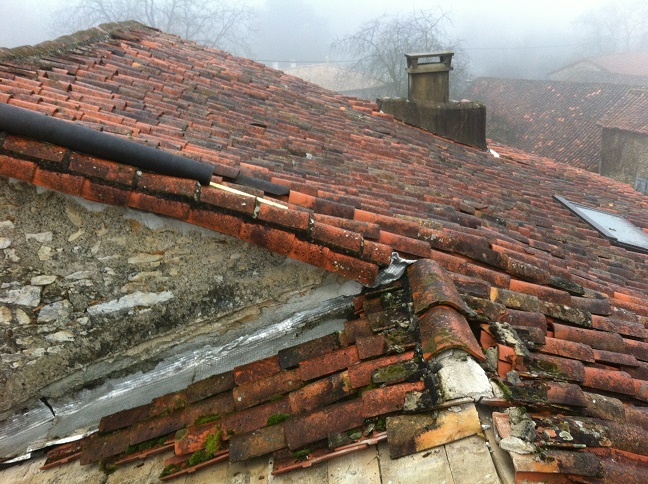 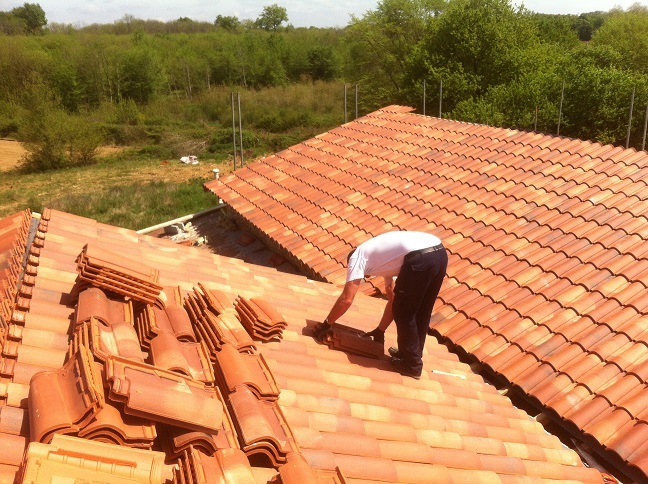 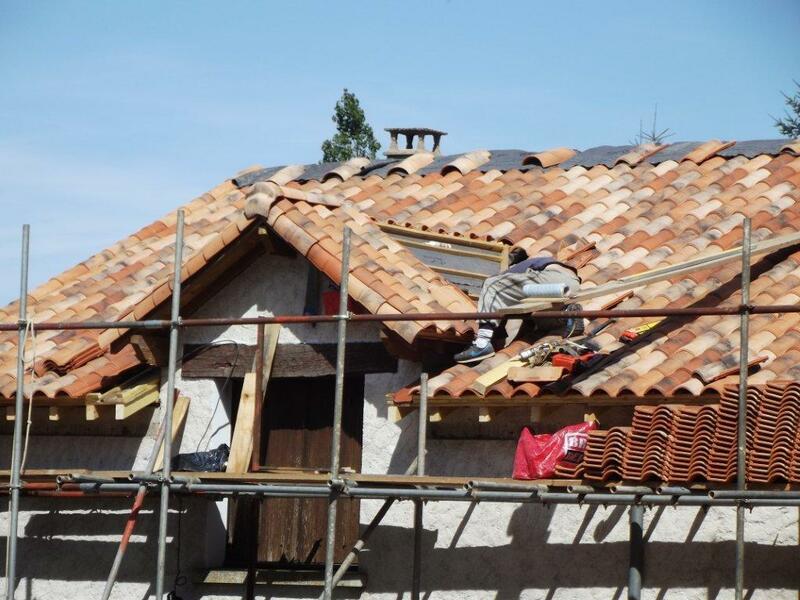 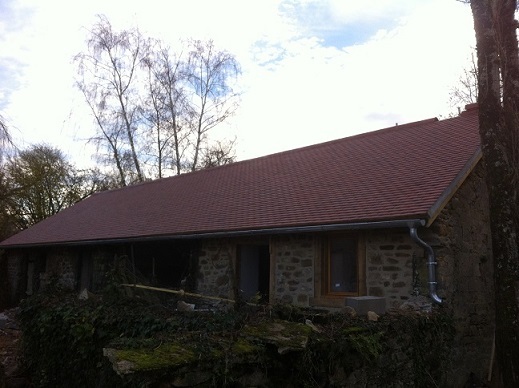 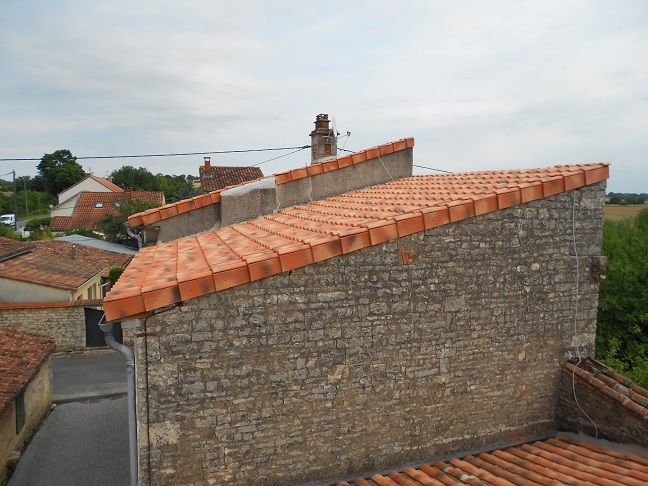 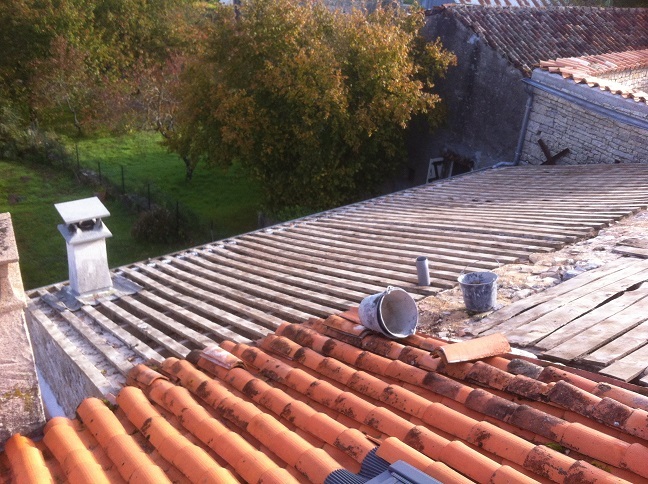 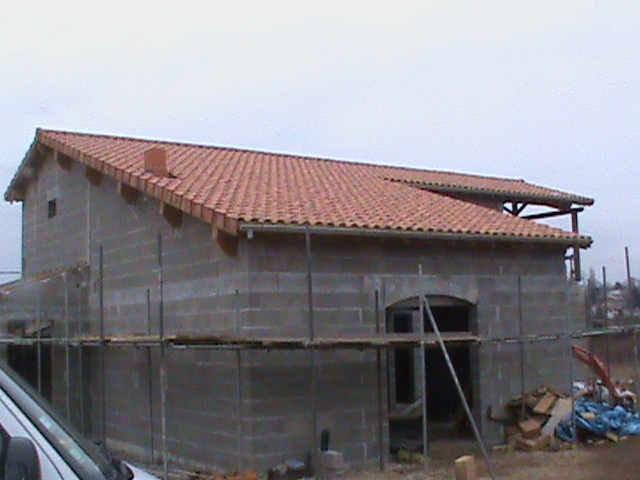 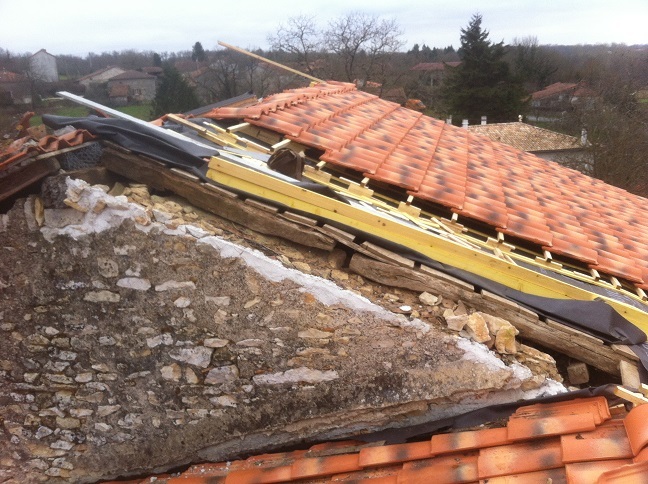 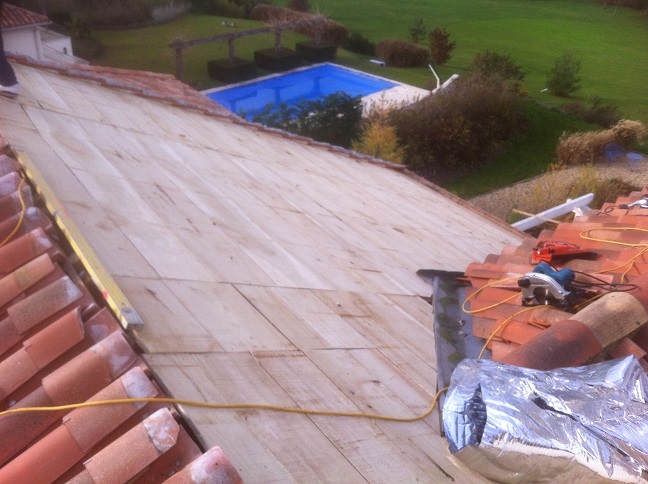 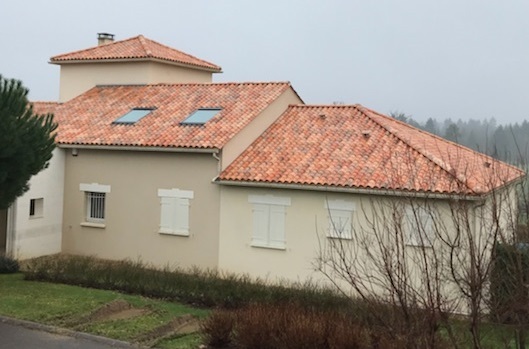 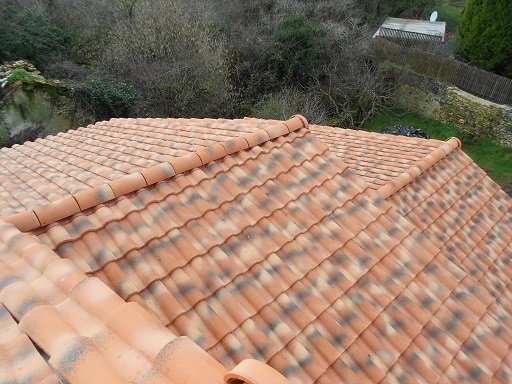 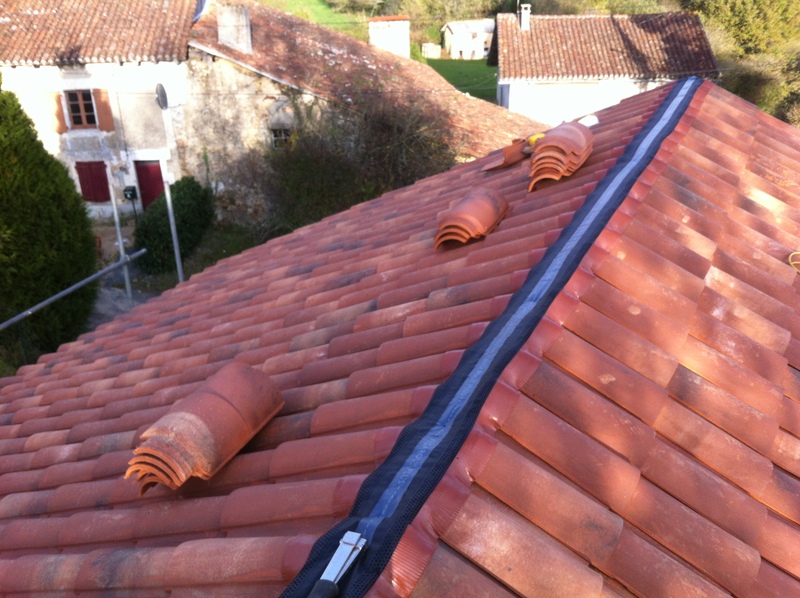 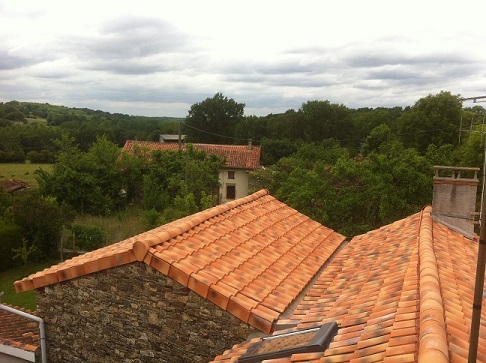 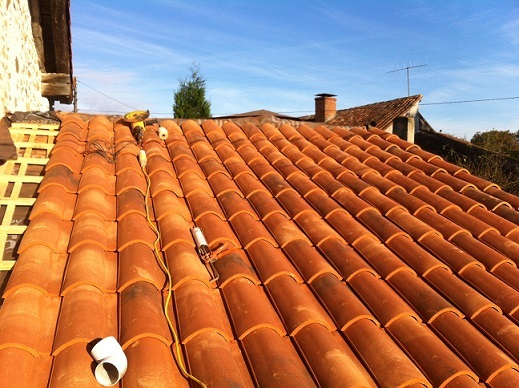 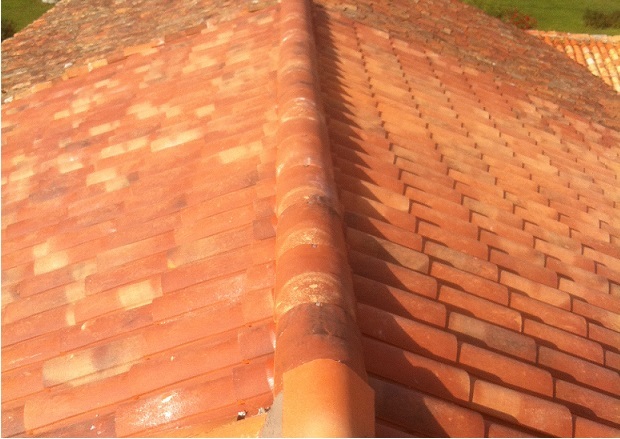 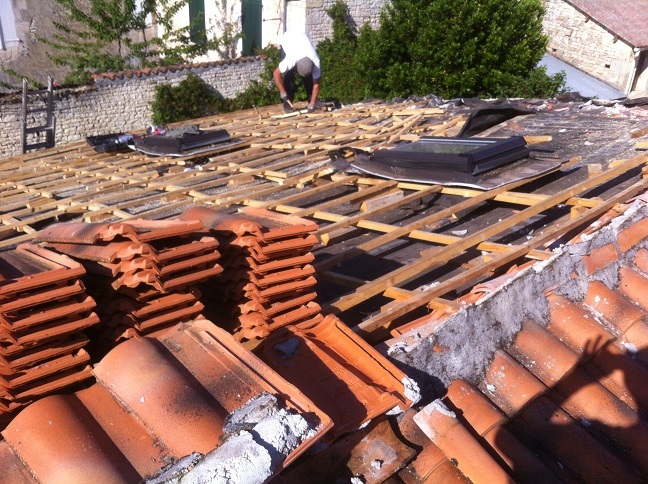 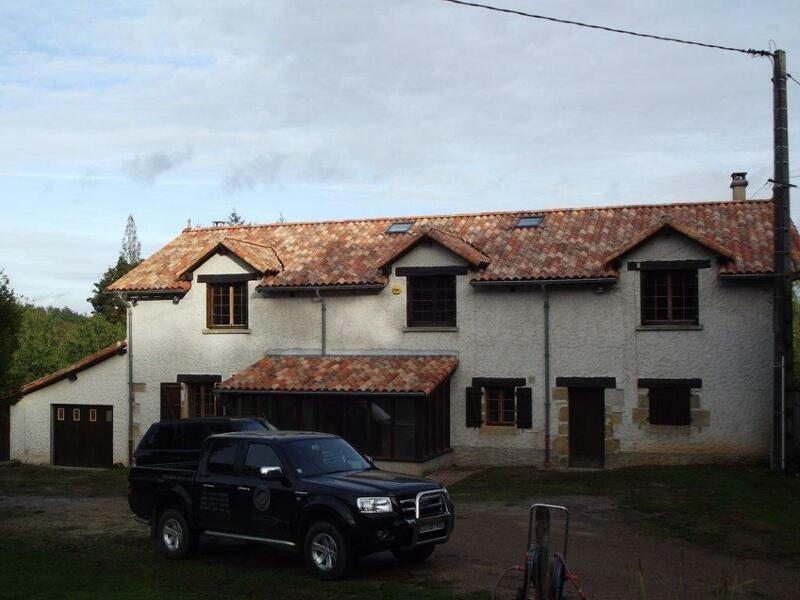 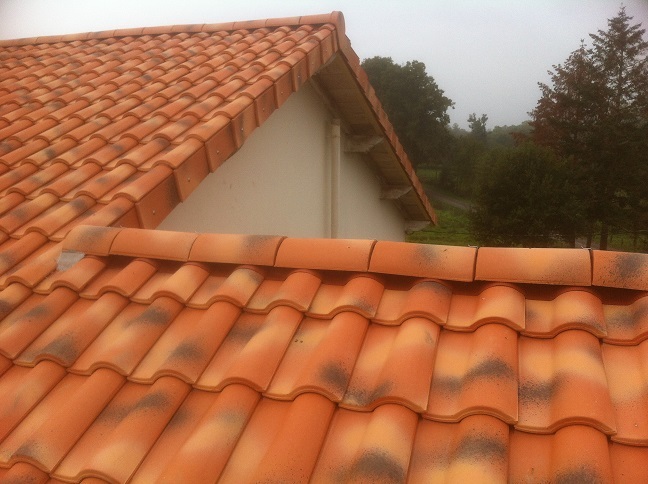 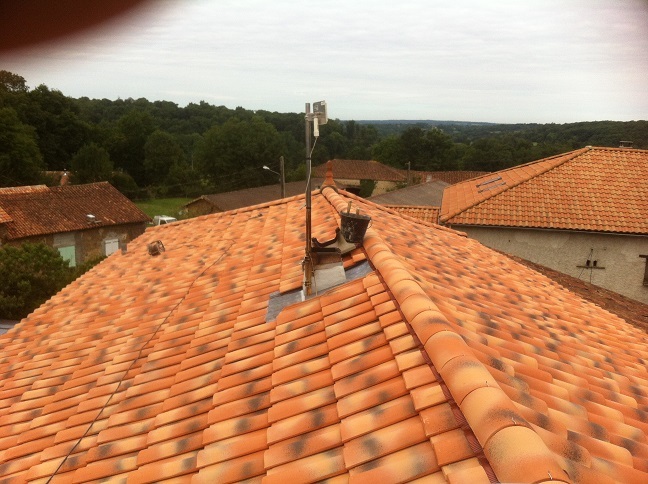 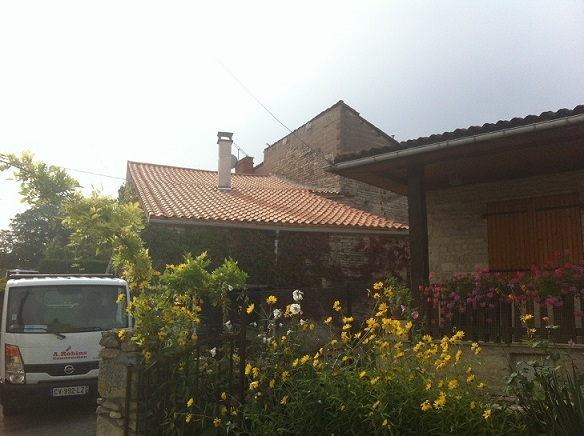 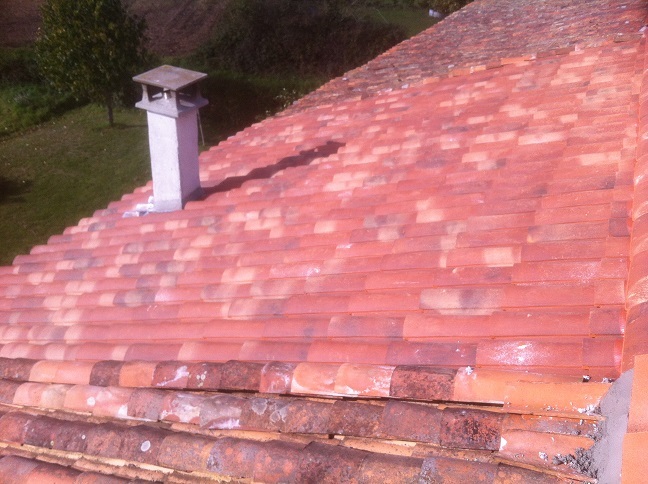 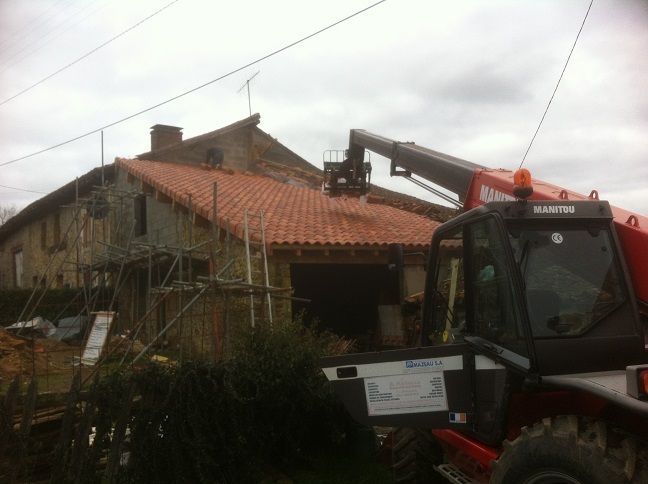 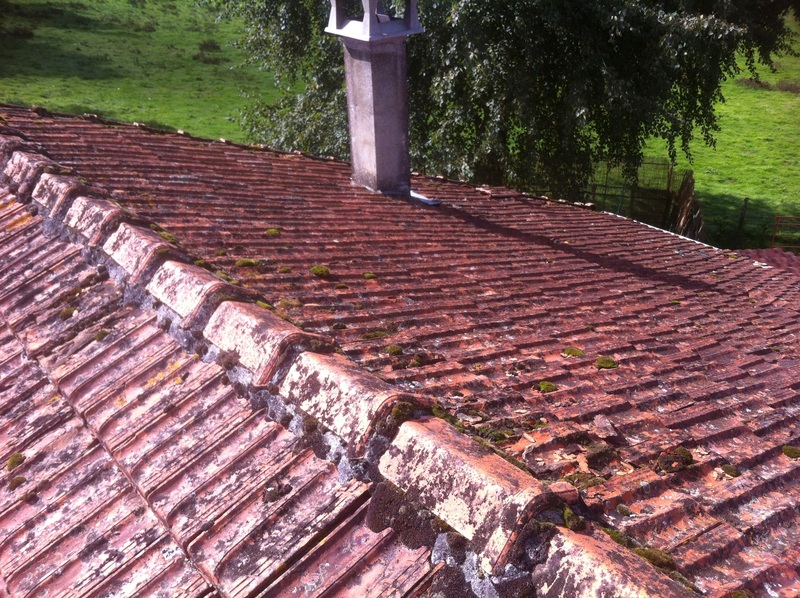 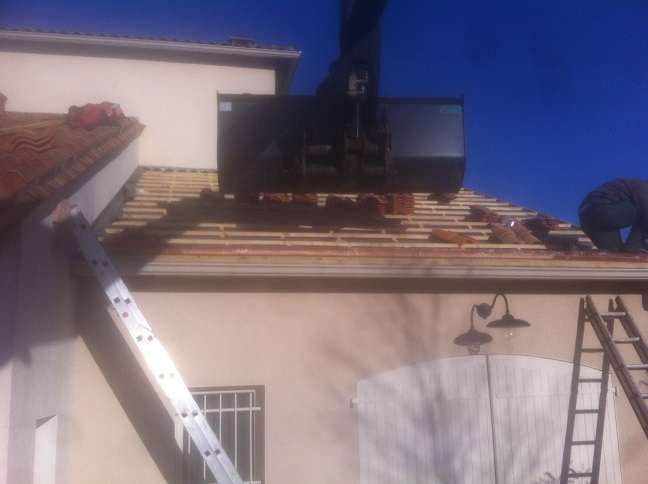 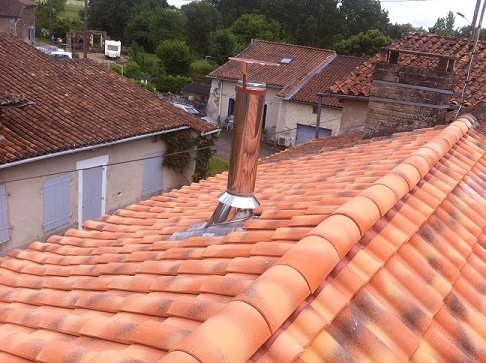 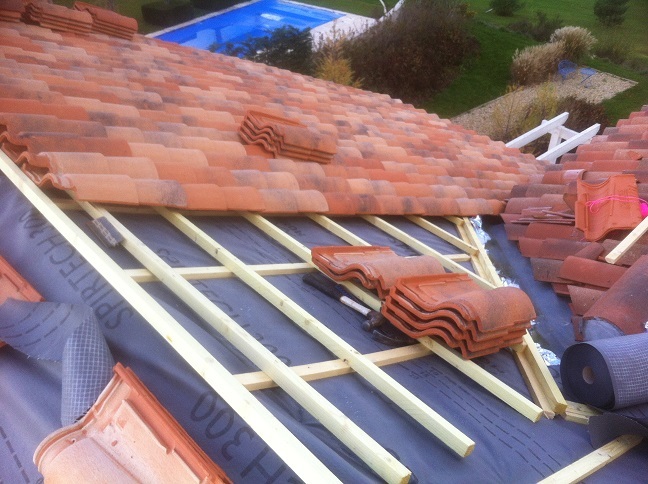 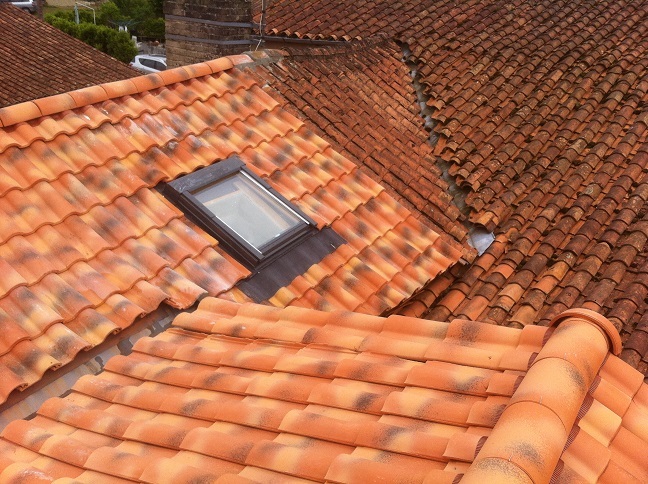 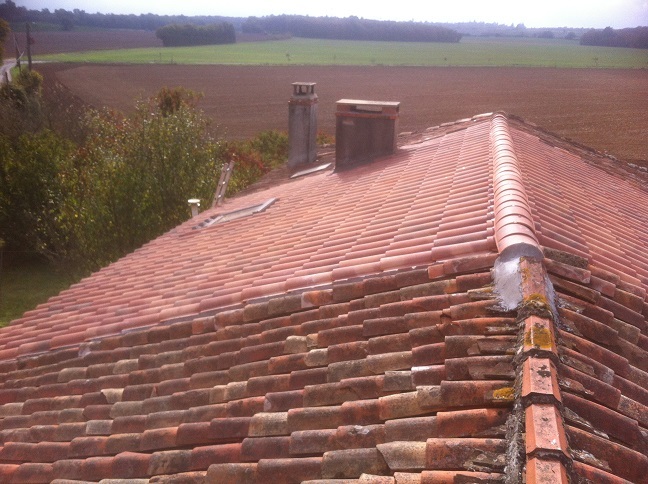 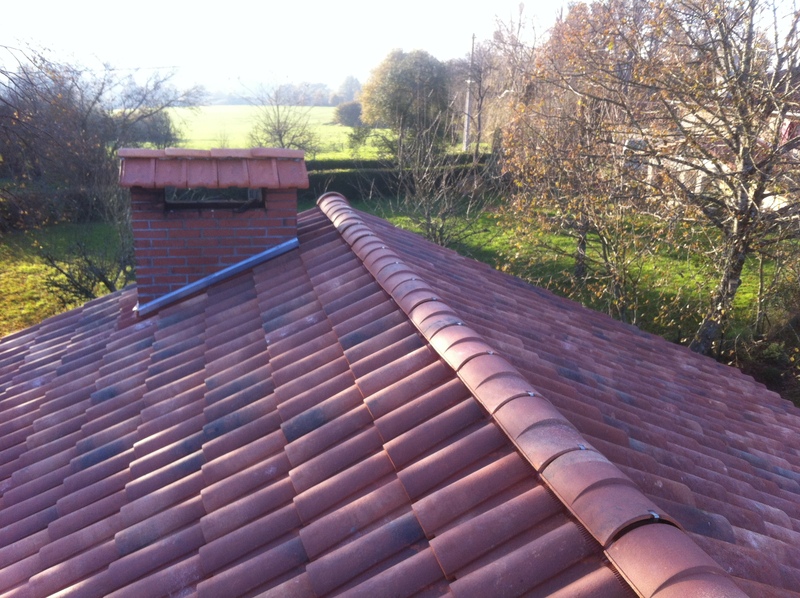 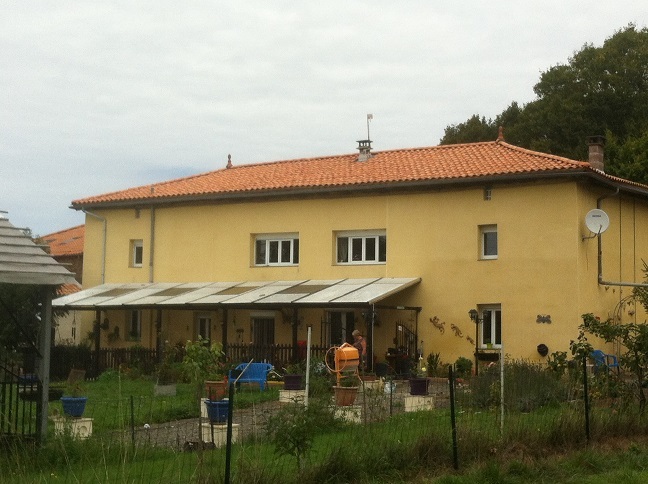 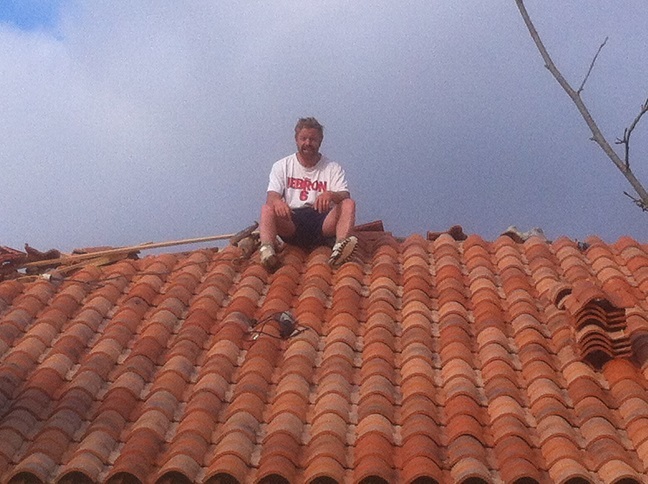 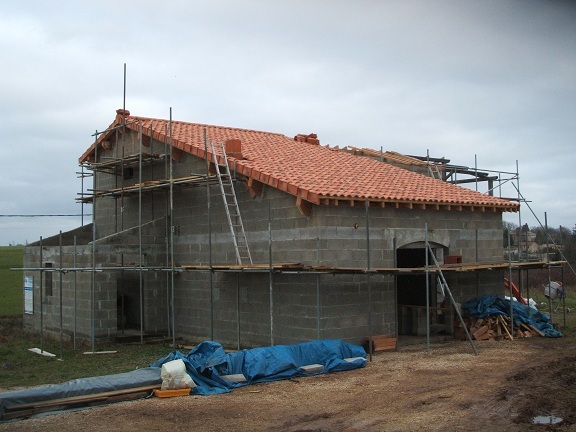 This roof had to be re constructed from scratch the tiles used were vieille france. 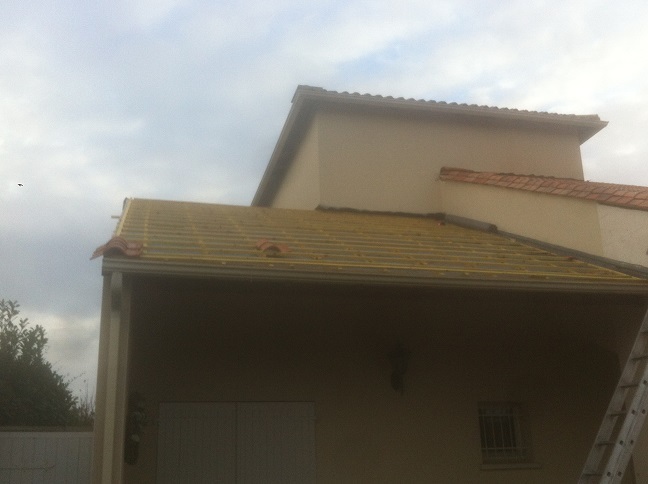 This Roof was constructed from scratch on a new build. 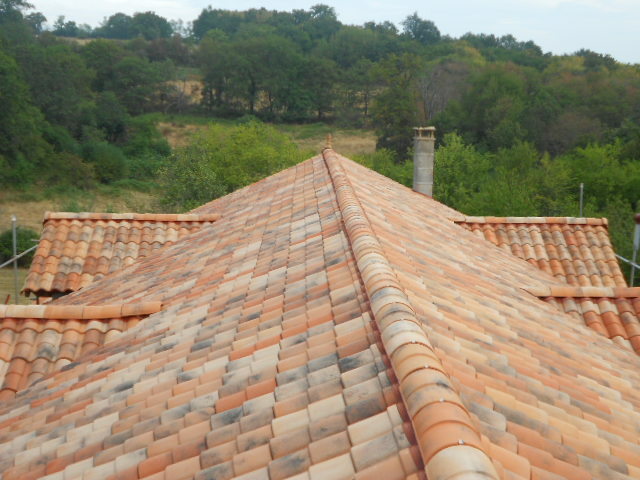 The tiles used were gallo romane xahara. 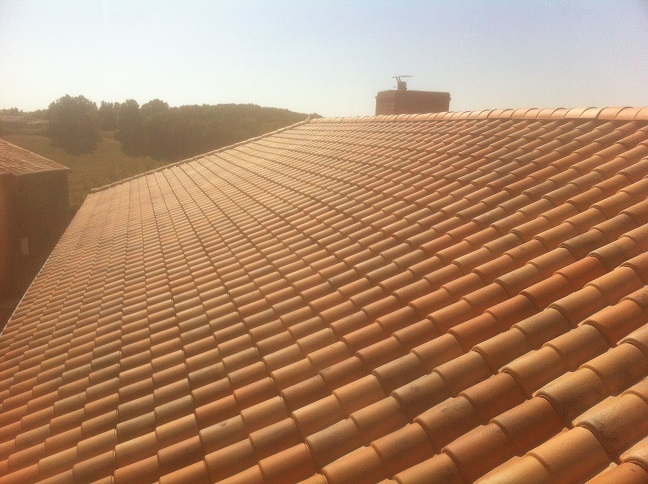 Here we used the standard Gallo Romane interlocking tiles, colour xahara. 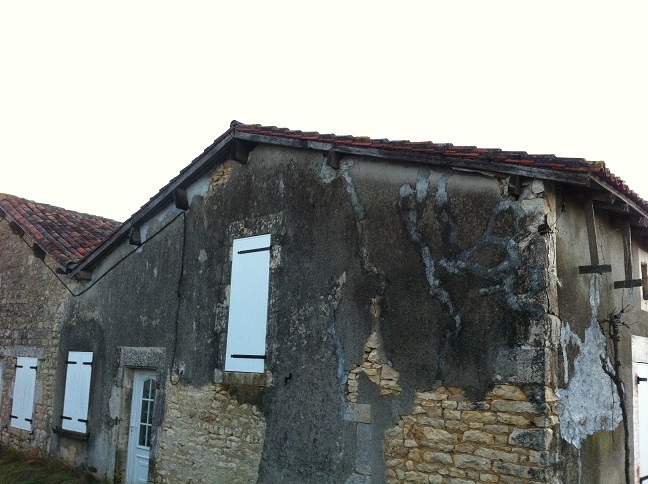 This house had only been re-roofed around 5 years ago by an "english builder". 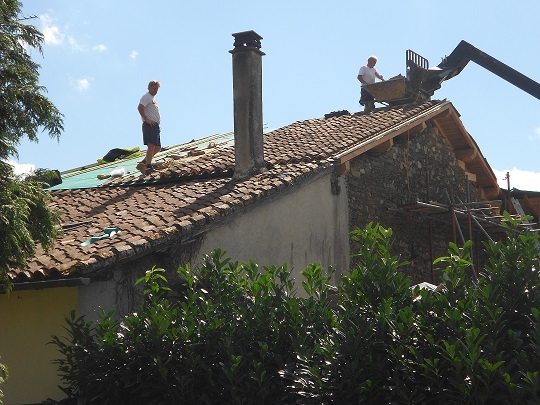 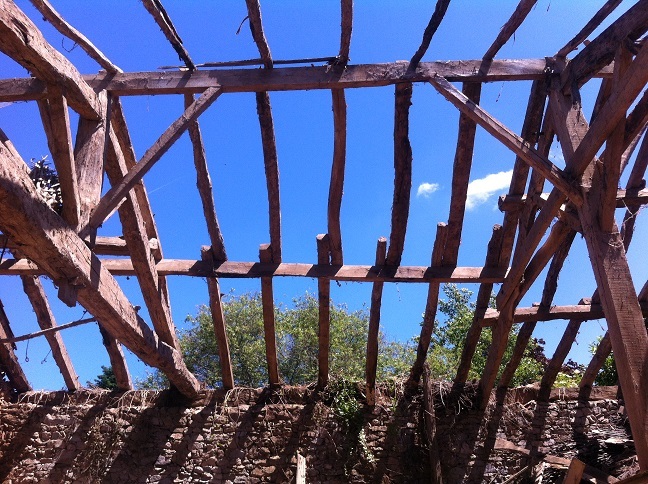 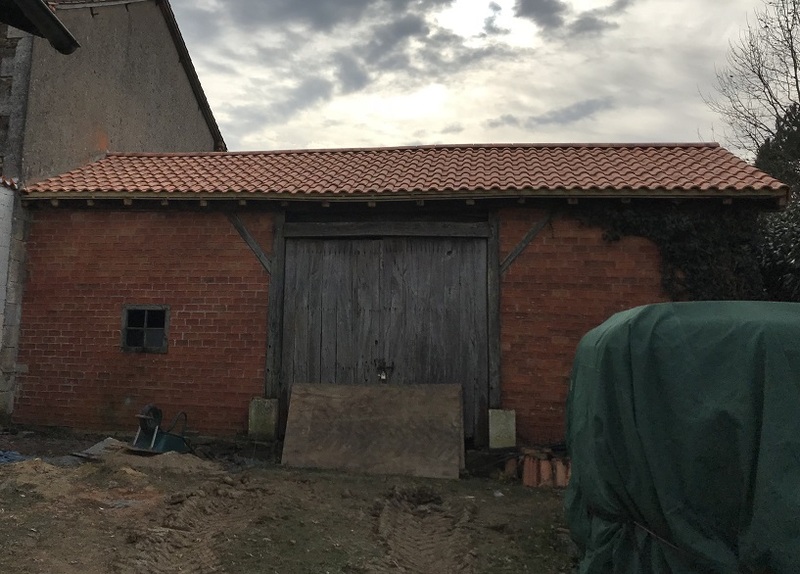 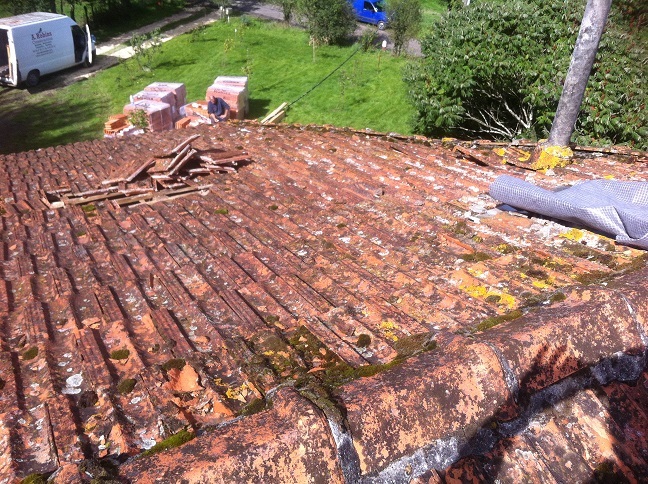 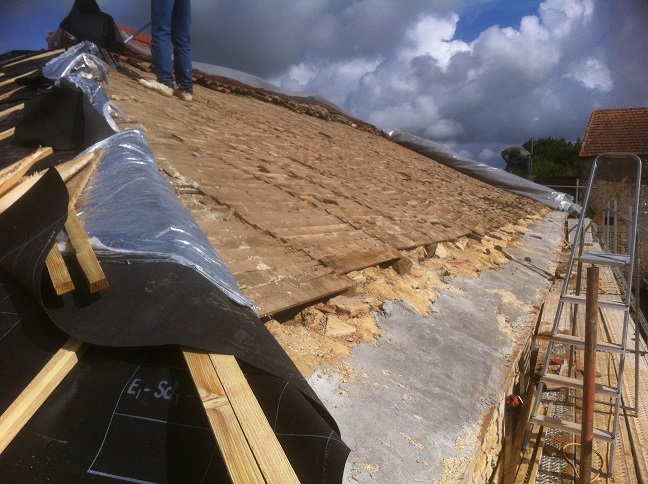 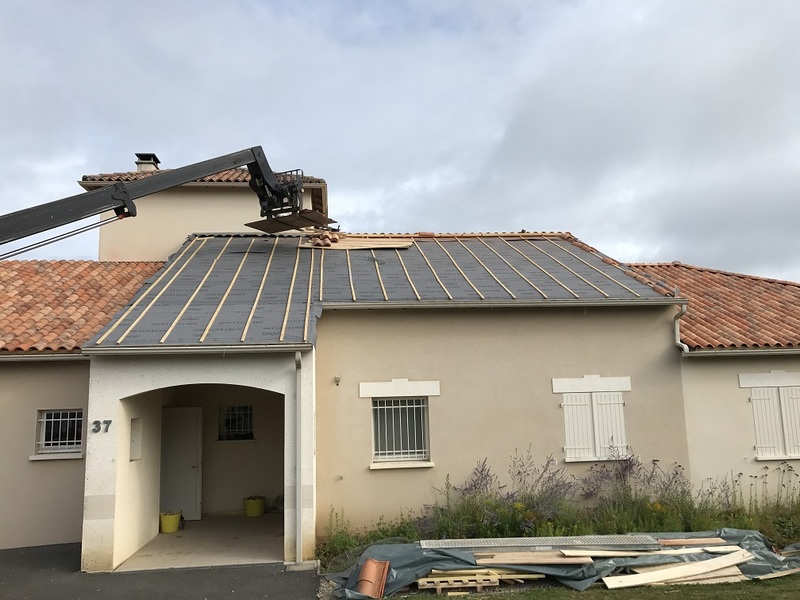 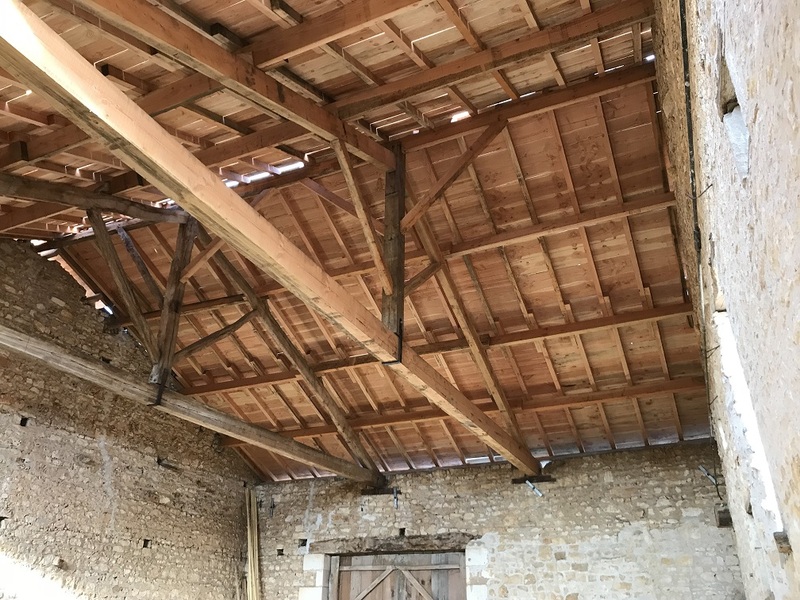 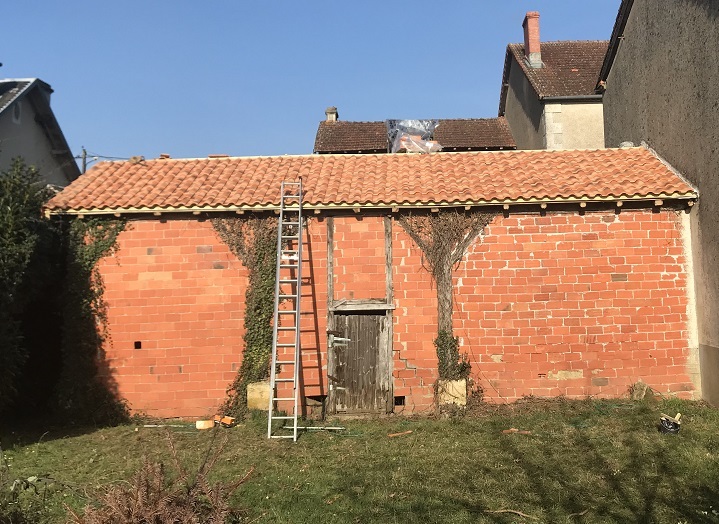 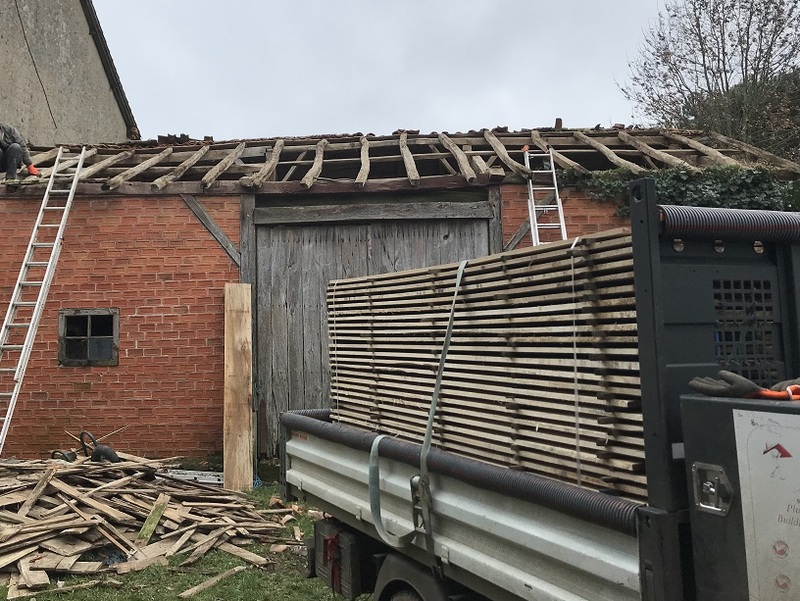 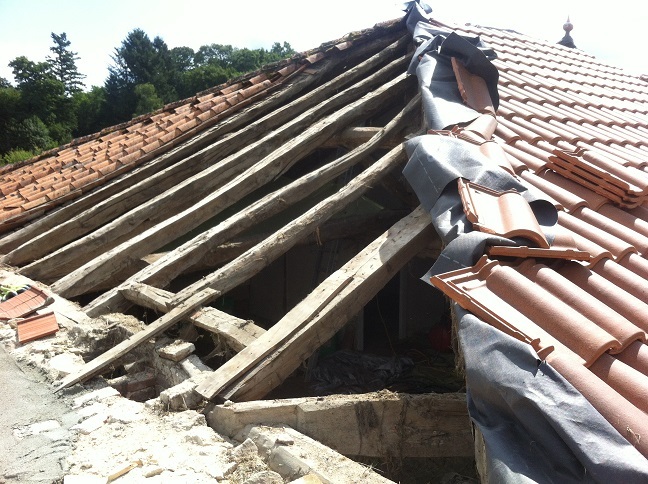 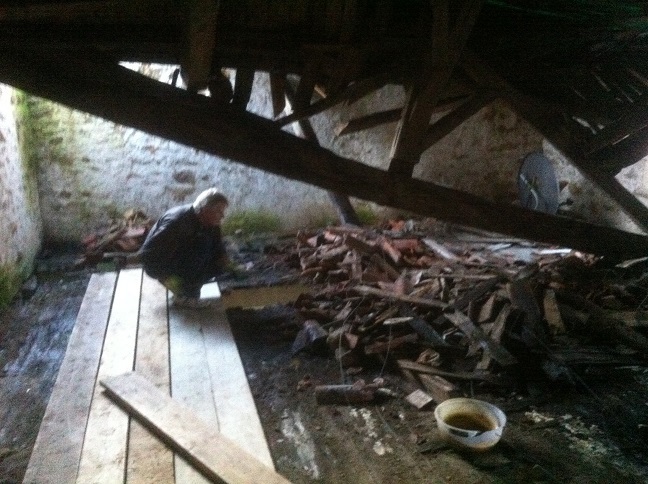 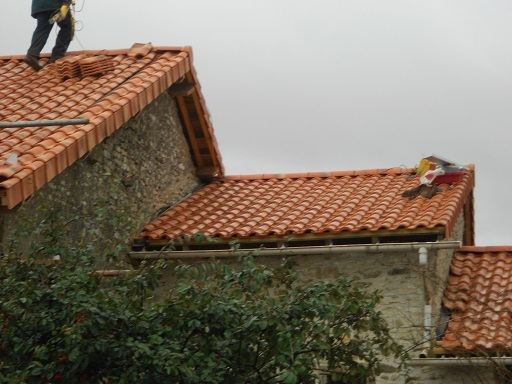 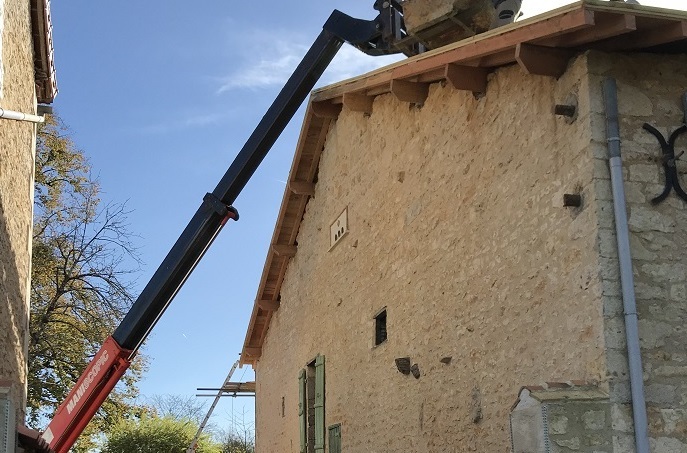 Adrian had to strip off all the tiles which were not layed correctly causing leeks and held together by tonnes of ciment, which is not usually needed, new close boarding had to be installed on half of the roof as the existing was rotten. 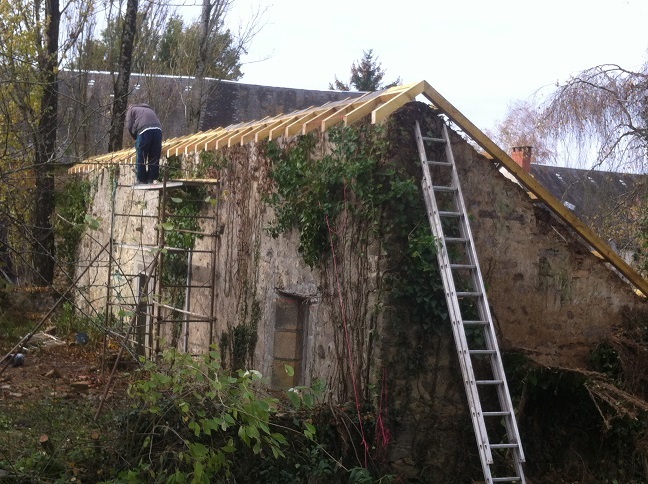 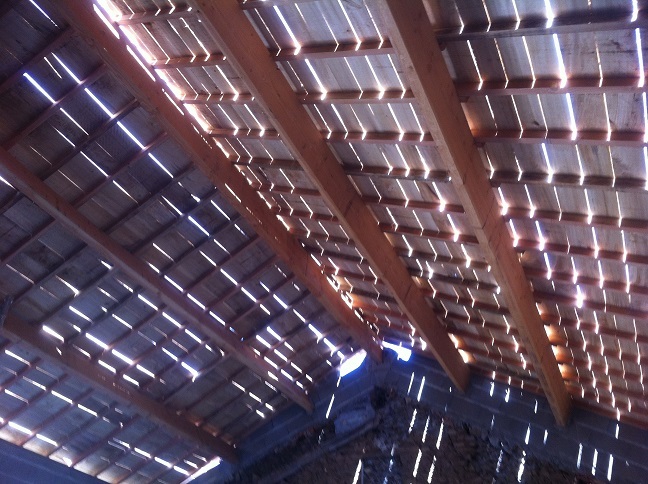 The roof had a massive dip which Adrian built up and straightened. 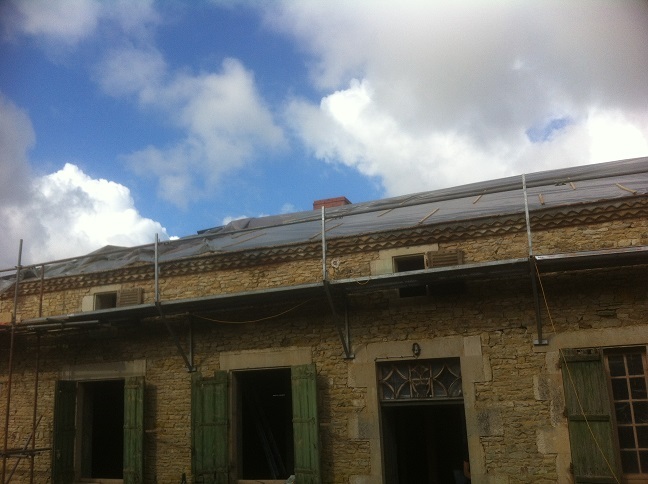 New overhangs had to be created & New veluxes had to be installed. 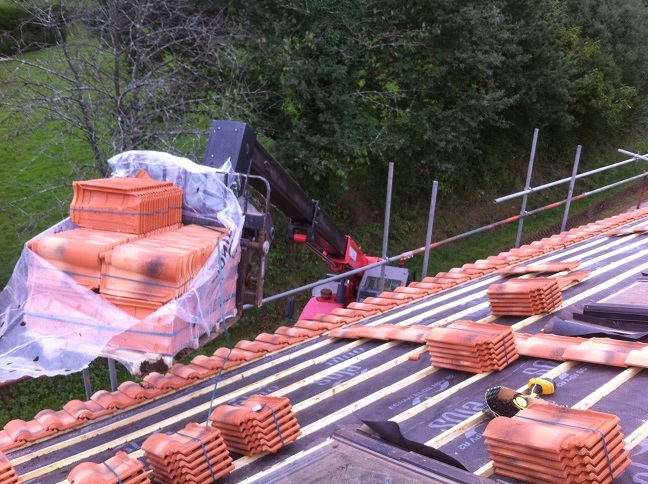 This is a good example of some of some of the poor workman ship which is out there. 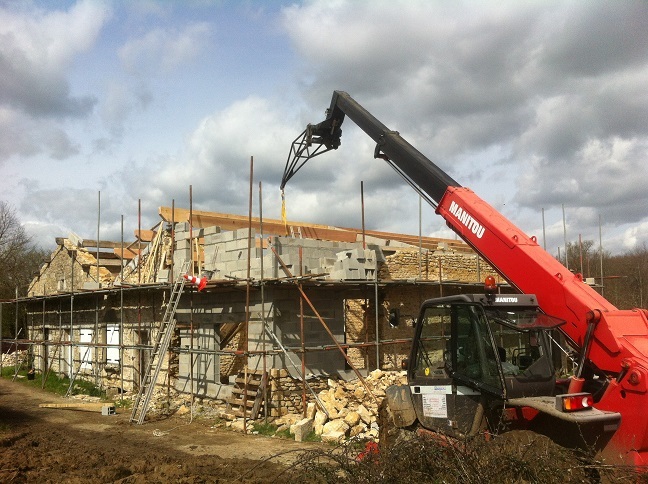 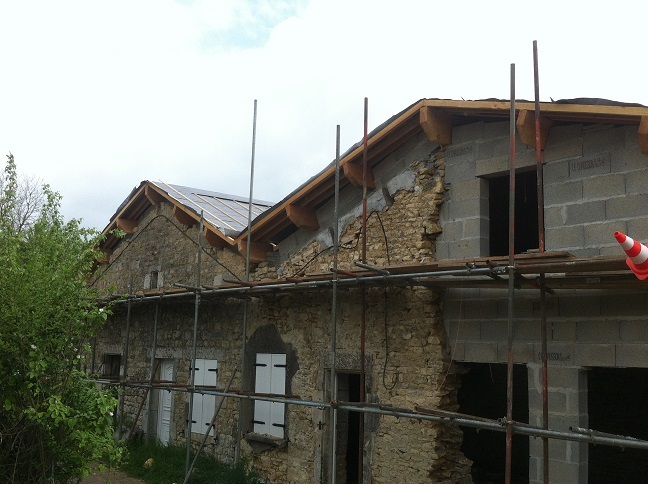 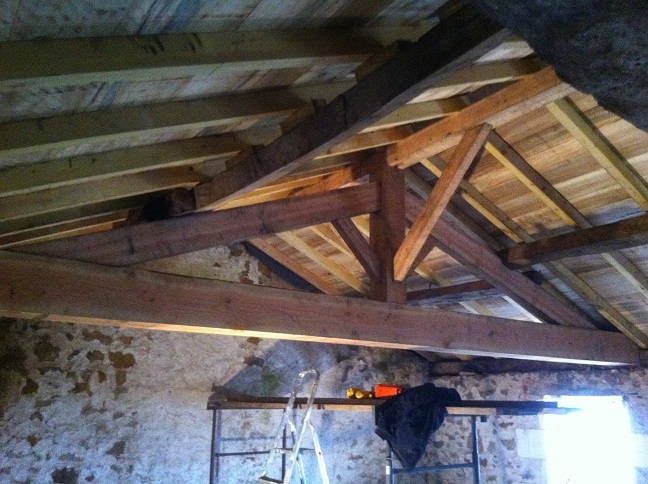 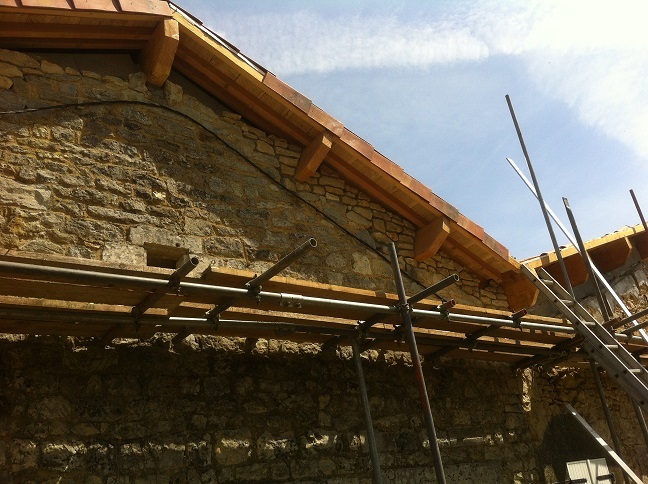 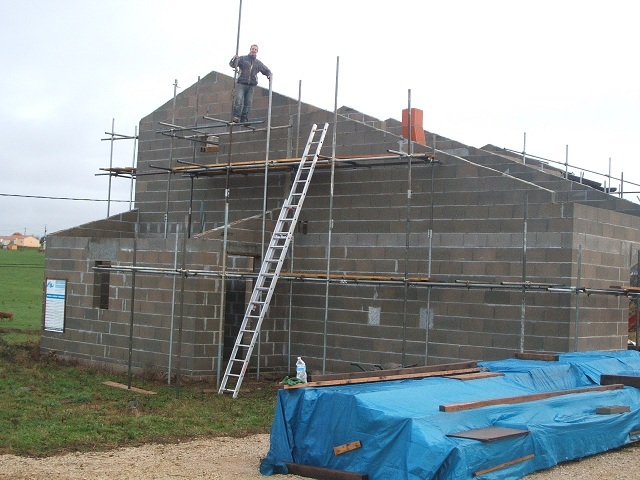 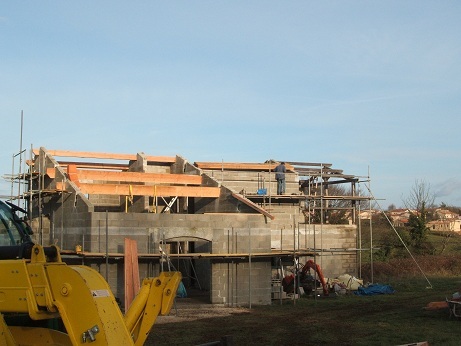 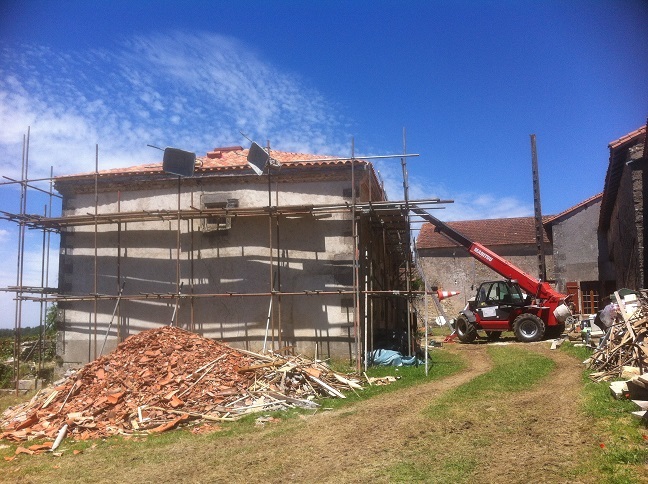 Barn conversion re build. 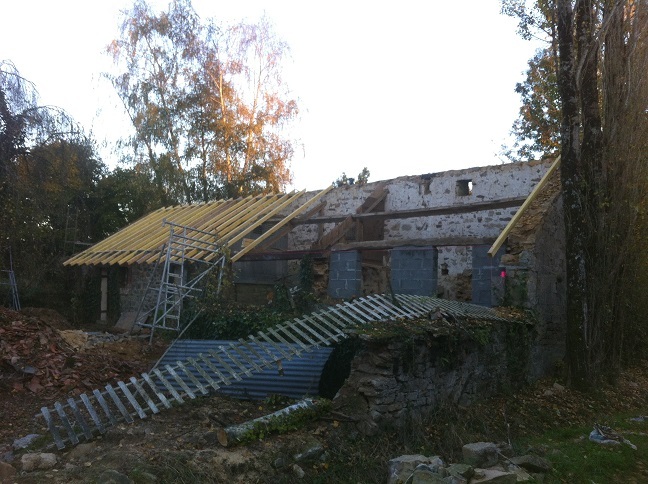 Go to renovation page to see more photos of its progress. 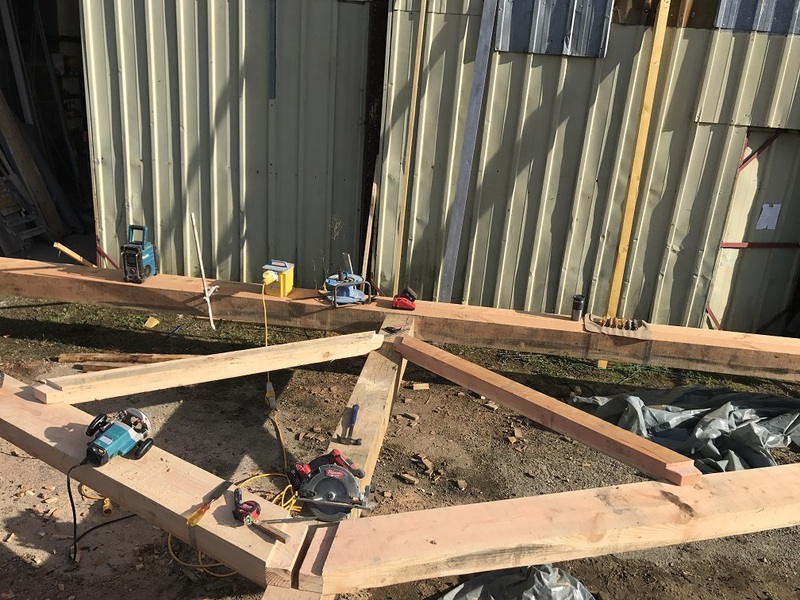 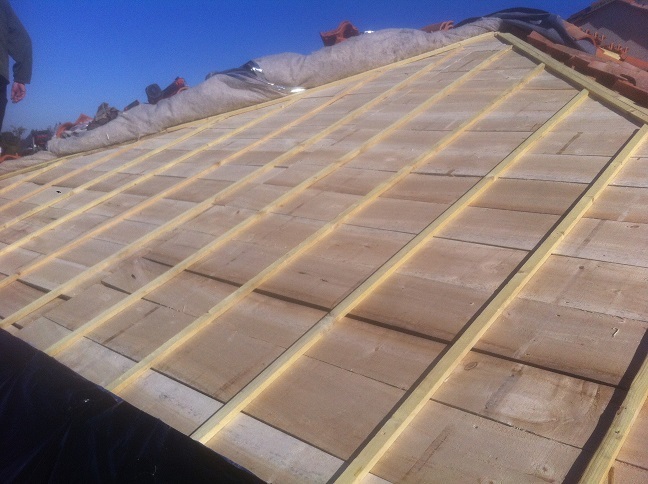 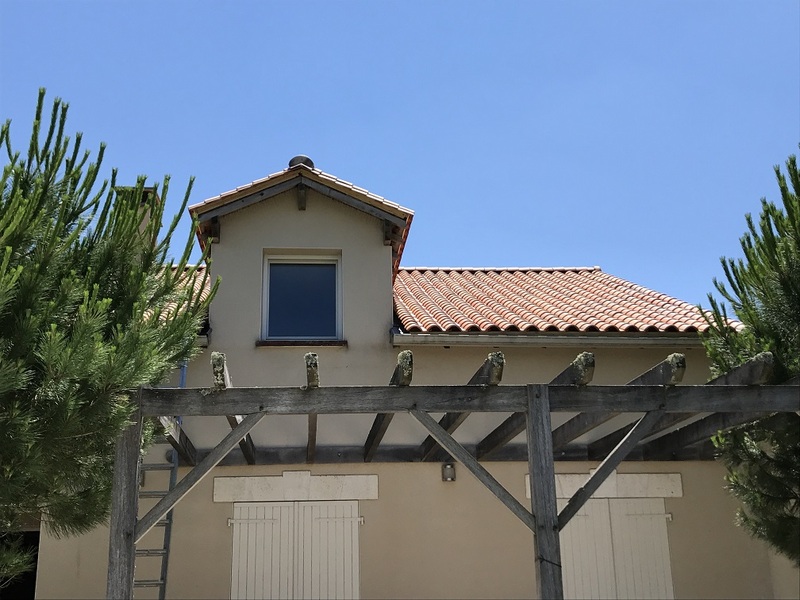 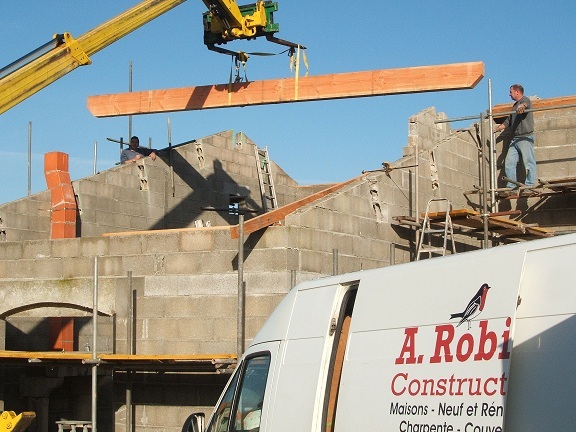 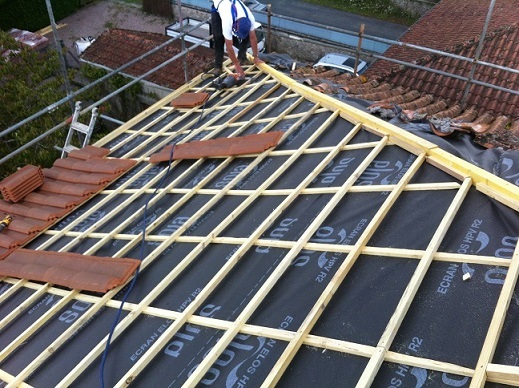 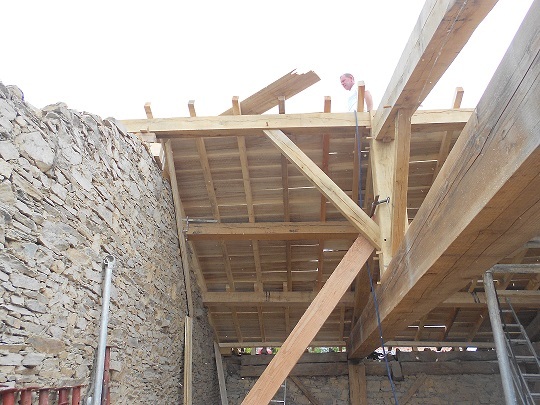 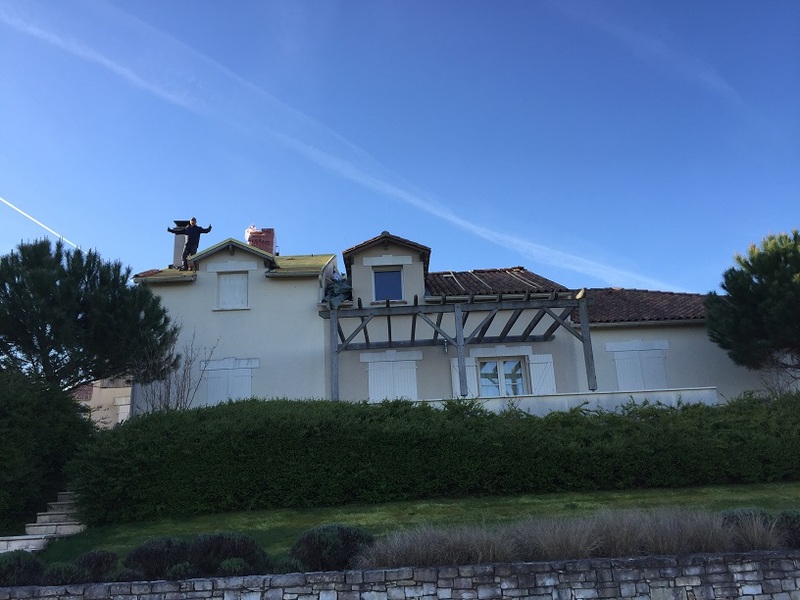 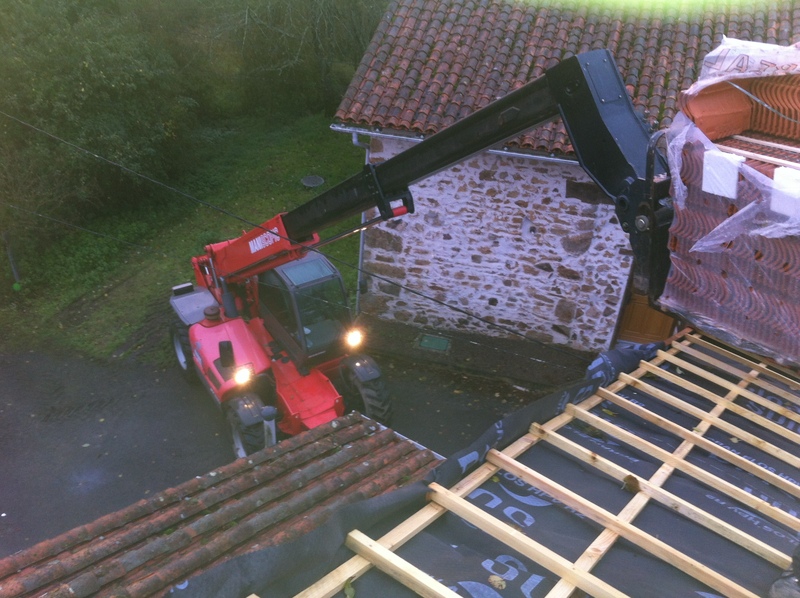 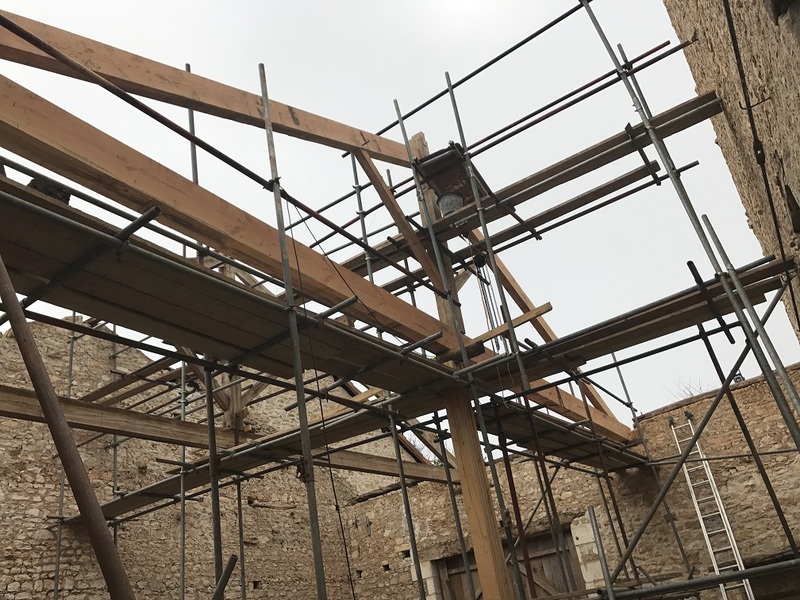 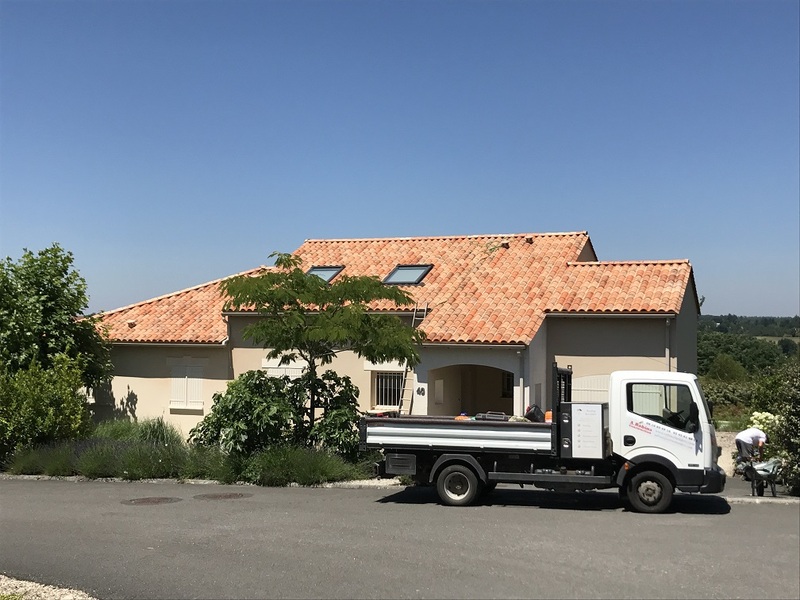 Most people lay on a beach when they are on holiday but not Adrian, He had to re roof this house due to a colapsing king post truss. 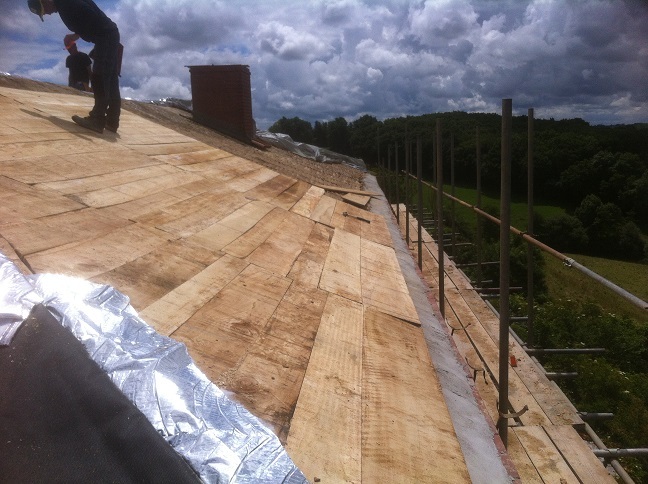 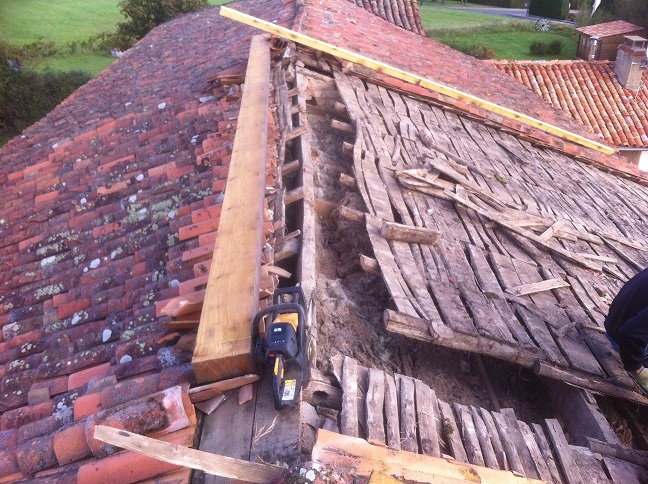 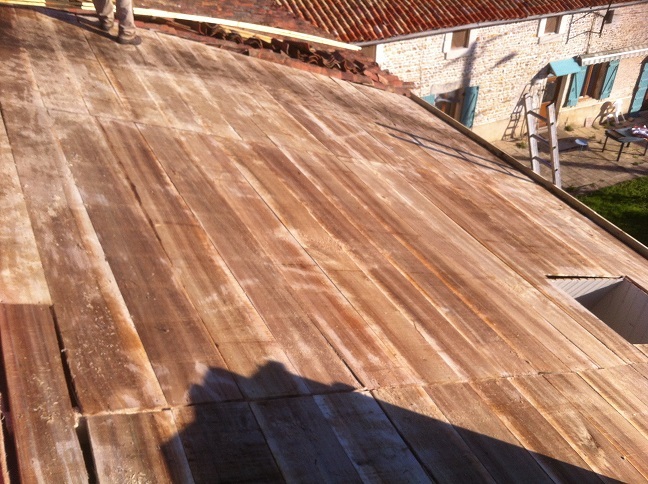 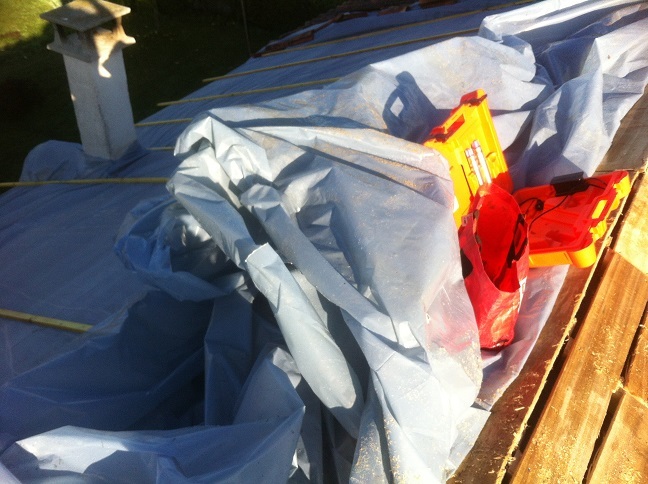 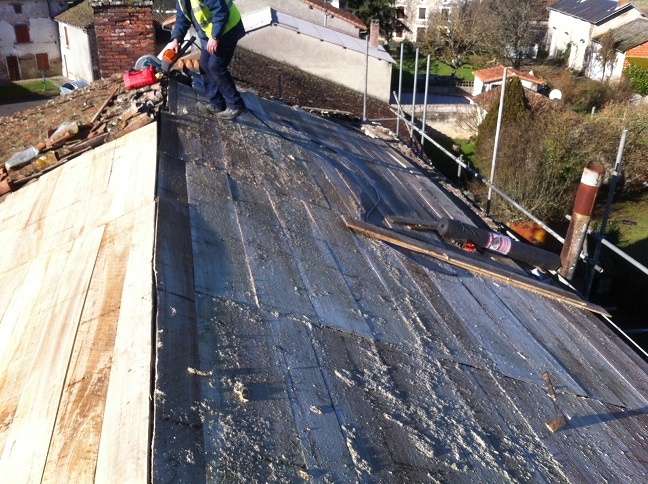 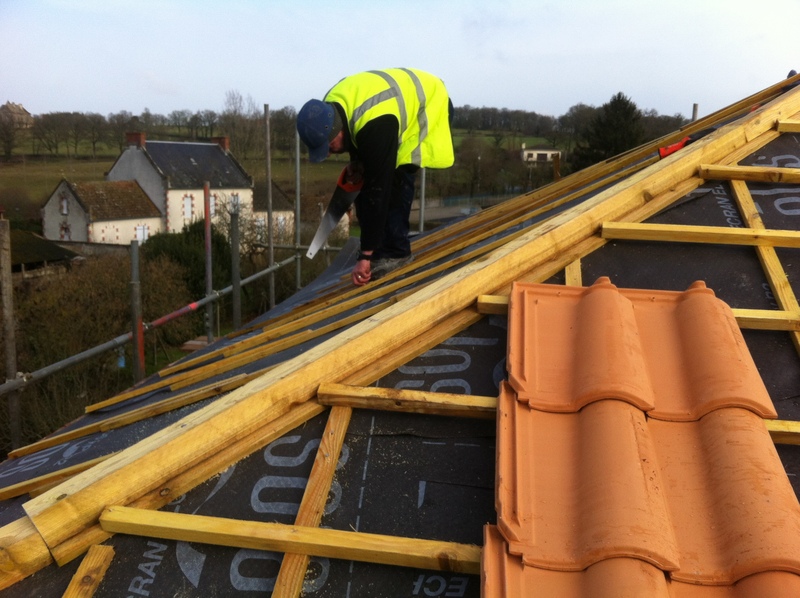 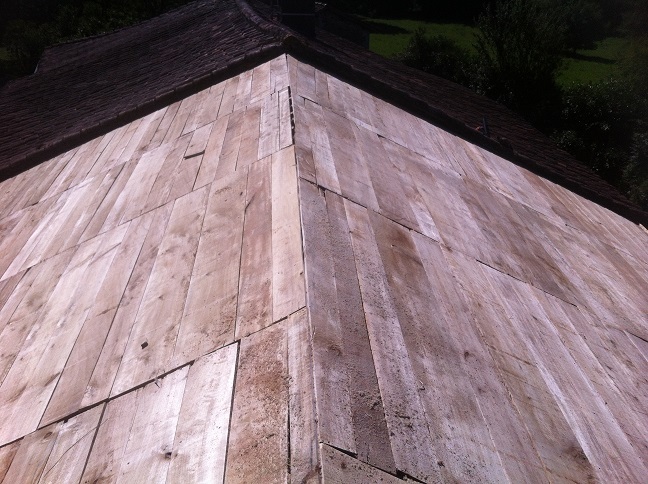 This roof had to be stripped off compleatly with new timbers installed & new volige. 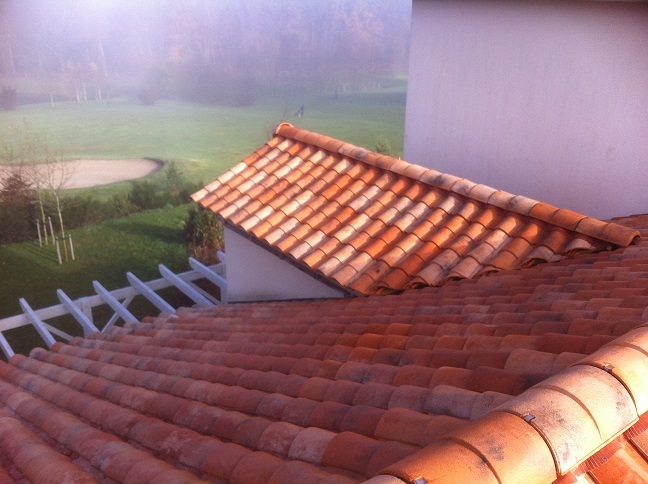 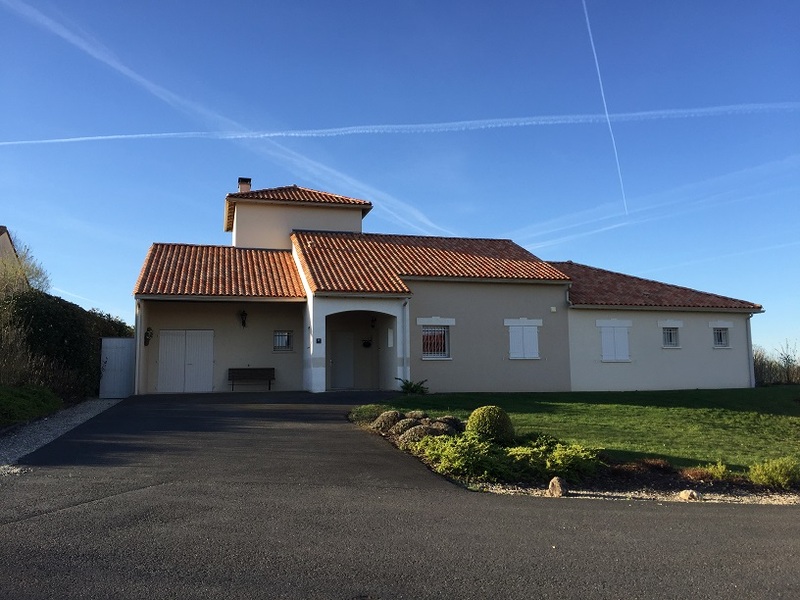 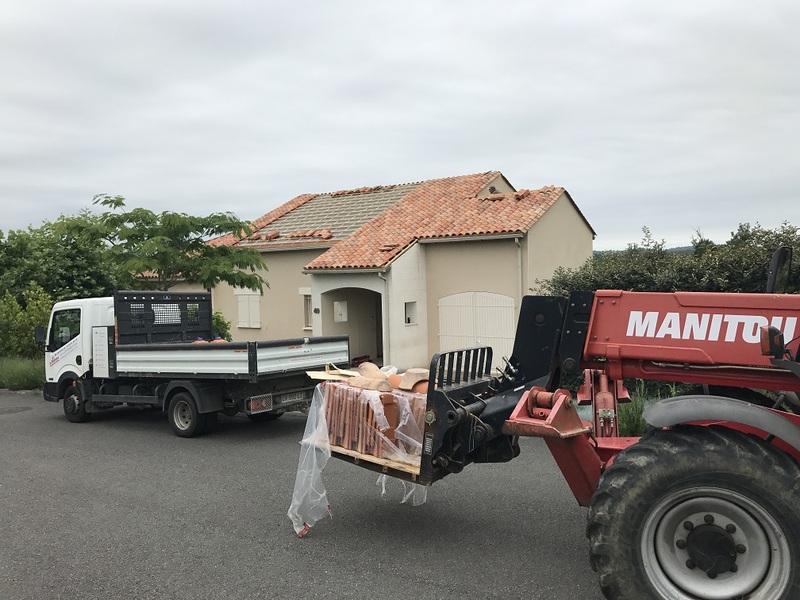 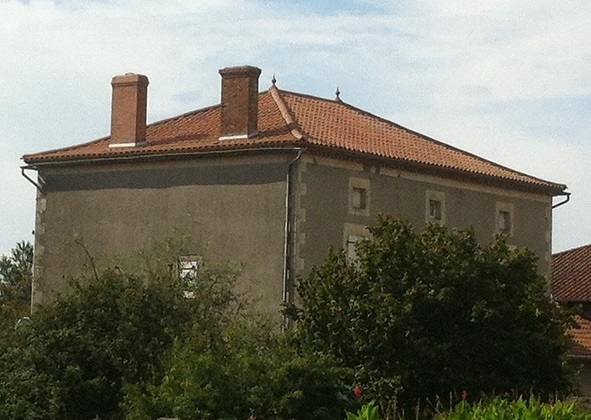 Tiles used horizon pays d'oc. 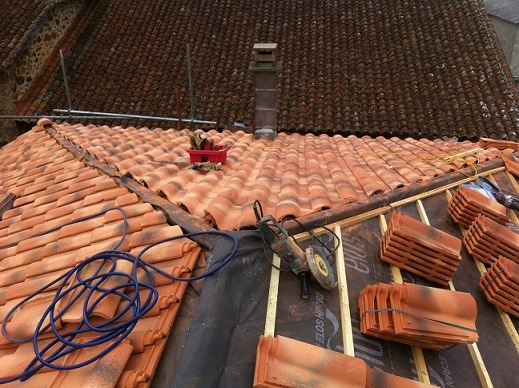 The interior of this property had already been finished to a high standard so extra precautions were made over night due to the rainy weather we have been experiancing. 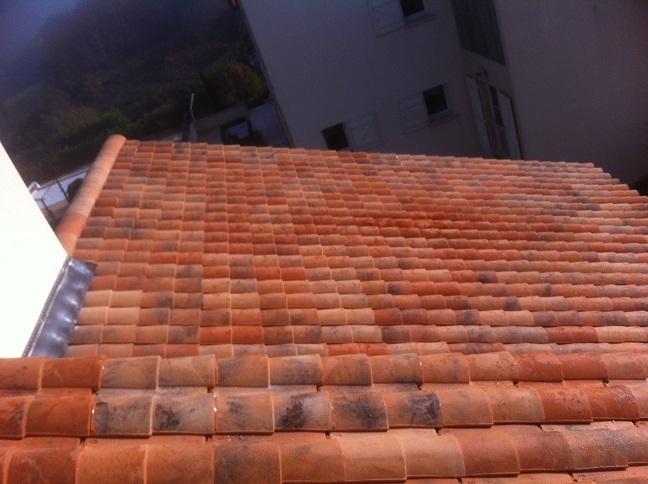 Here we have a simple re-tile, using gallo romane colour xahara.